See the evolution of design and its impact on craftsmanship and the decorative arts during the 20th and 21st centuries through a story told quietly and beautifully by a unique selection of iconic vases. courtesy of: MAK - Austrian Museum of Applied Arts/Contemporary Art Glass vessel This purple vase in the Art Deco style was designed by Josef Hoffmann and manufactured by Johann Oertel & Co. around 1920. The sides of the moulded crystal vase have been cut using an abrasive tool. A light grinded glass finish provides the somewhat matt finish. Josef Hoffmann was a central figure in the evolution of modern architecture and design in Europe. He progressively rejected the rich and extravagant ornamentation inherent in 19th-century design and put a strong emphasis on simplicity of line. Along with Koloman Moser, Hoffmann would found the Wiener Werkstätte (Vienna Workshop) in 1903, a design cooperative based in Vienna that produced houseware and furniture. The workshop brought together a range of designers, artisans and architects and has been credited with setting the foundations for the Bauhaus style. The workshop evolved from the Vienna Secession, founded in 1897 by a group of Austrian artists, including Gustav Klimt, who was its first president. 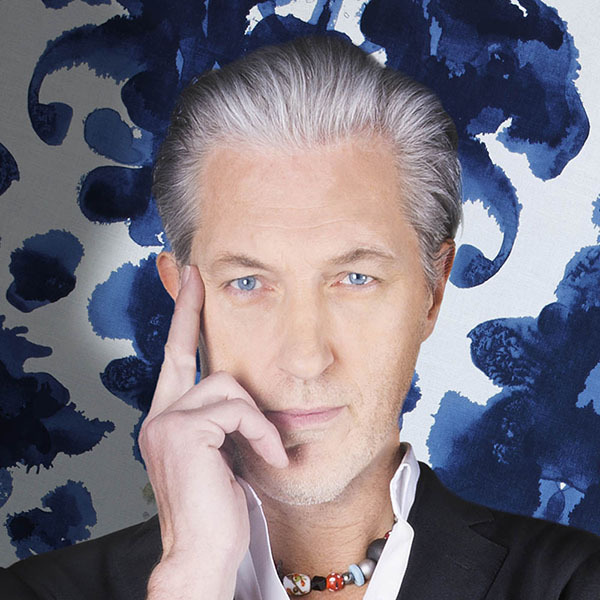 Hoffmann's works combine contrasting design visions into avant-garde creations. Johann Oertel & Co. is a family-run glassblowing business founded in Haida in 1869, in the then Austro-Hungarian Empire. It produces mainly crystal glass and lead crystal. The founder of the company, Johannes Christian Oertel, filed several glassmaking patents, including for a method for producing coloured decoration on hollow glass objects. With the redrawing of national borders in 1945, the company moved to Welzheim, near Stuttgart, where its headquarters are still located. In 2014, the brand name was changed to OertelCrystal. Josef Hoffmann (1870-1956) was a founding member of the Vienna Secession, a group of artists that included Gustav Klimt and Koloman Moser. Hoffmann was a prominent architect and a designer of consumer goods. He studied at the Academy of Fine Arts in Vienna and from 1899 taught at the Kunstgewerbeschule (School of Arts and Crafts), now the University of Applied Arts Vienna. 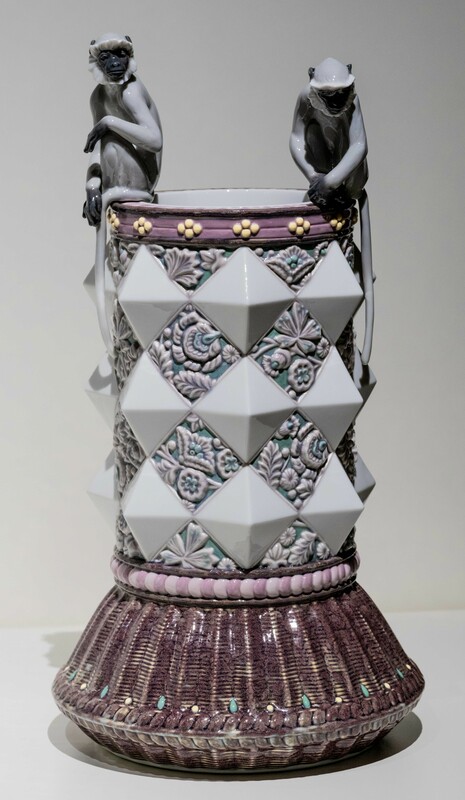 courtesy of: MAK – Austrian Museum of Applied Arts/Contemporary Art Ceramic vessel The exterior of the vase is covered in symmetrical patterns. These alternate between a blue glaze on one face of the vase and a darker glaze on the other. The body and the base of the vase are connected by triangular white glazed structures. 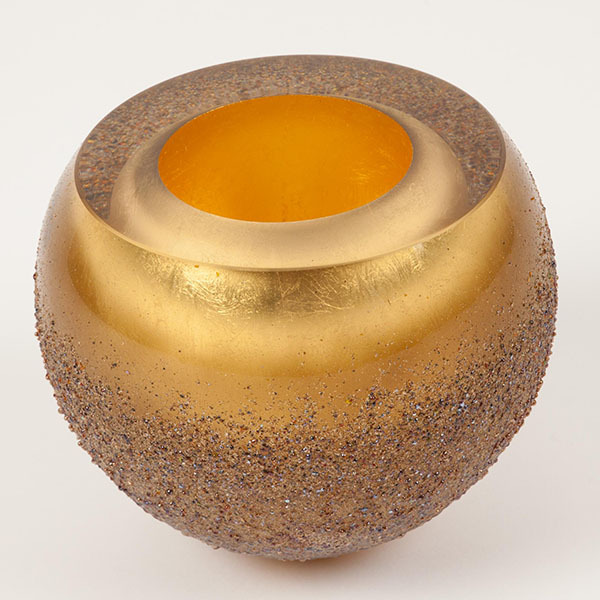 A gold glaze shines out of the interior of the vase. Jaroslav Horejc devoted his creative vision to two fields, sculpture and the applied arts. While his efforts and passion focused on sculpture, he was primarily recognised for his design contribution to the applied arts. For most of his career, Horejc's works were seemingly out of place and his increasingly geometric forms did not fit entirely with the more organic aesthetic inherent in the Art Nouveau style that marked the turn of the 20th century in Europe. However, as the organic forms of Art Nouveau began to make way for the geometric designs of Art Deco, his works received widespread recognition. The body of his works would later be placed within the latter style. Born in Prague in 1886, Jaroslav Horejc devoted his life to design and sculpture, both teaching and producing important works in the Art Nouveau and Art Deco styles. Horejc began working at a lithographic workshop at the age of 14, but after a few weeks switched to the vocational school for jewelers, goldsmiths, silversmiths and metal. Between 1906 and 1910, he studied at the Prague School of Applied Arts, becoming a teacher at the same school in 1912 until his retirement in 1949. His works derive much of their themes from Greek mythology and the Old Testament. courtesy of: MAK – Austrian Museum of Applied Arts/Contemporary Art Ceramic vessel This three-sided, pyramid-shaped ceramic vase with a triangular base was designed by Vlastislav Hofman and manufactured by Rydl & Thon Svijany-Podoli in 1914. Shades of red glaze alternate and contrast with white glaze. The vase, painted with triangular patterns, is representative of pre-First World War Czech Cubism. Between 1912 and 1914, Prague was one of the most important centres of Cubism outside Paris. For Vlastislav Hofman, Cubism represented a radical shift from the style prevalent at his university and prompted in him the desire to search for and develop a new style. The Cubist movement spread through Prague in the years leading up to the First World War and found its expression in the city's new architectural designs. In the post-war years, along with a number of other artists calling themselves the Tvrdošíjný (Obstinate) Group, Vlastislav Hofman endeavoured to perpetuate the Avant-Garde artistic movement and pre-war processes. However, artistic differences within the group resulted in a definitive split in 1924. Best known for his architectural designs influenced by the Cubist movement, Vlastislav Hofman (1884-1964) was also an accomplished designer and artist. He studied in Prague between 1902 and 1907 but was also a self-taught artist. 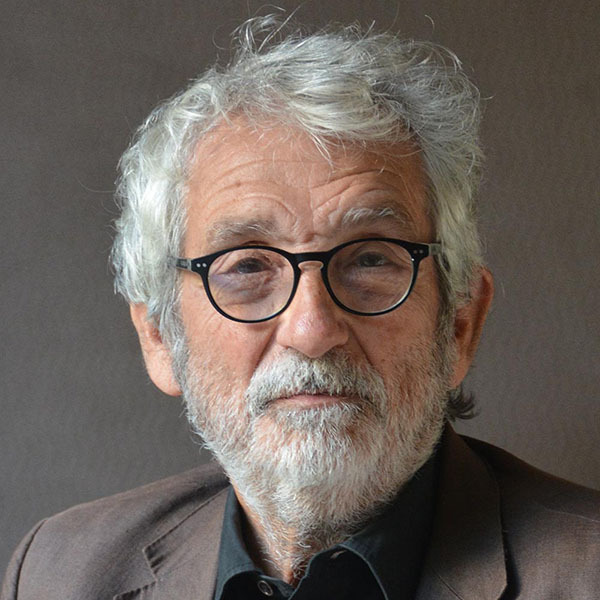 As well as working as an architect, artist and set and furniture designer, he wrote a number of essays on political thought and the philosophy of art. courtesy of: MAK – Austrian Museum of Applied Arts/Contemporary Art Ceramic vessel A purple pink ceramic octopus placed at the opening of the vase spreads its tentacles down the sides of a progressively darker green vase. The organic lines of the tentacles gradually become transparent and merge into the green glaze of the vase. The vase was manufactured by Rörstrand in Stockholm in 1900, at the height of the Art Nouveau period. Having mastered bone china and porcelain making techniques, Rörstrand quickly became one of Sweden’s largest companies. It diversified its range of dinnerware to create services with numerous pieces. The company made an international breakthrough at the 1900 Exposition Universelle in Paris, where it exhibited tableware in the Art Nouveau style. Following its success and growth, Rörstrand moved its entire operation from Stockholm to Gothenburg in 1926. Rörstrand was one of the most important Swedish manufacturers of ceramics and porcelain. The factory was built in 1726 and originally produced faience. It succeeded in producing bone china in 1857 and porcelain in the 1880s. By the 1900s, the factory was a major porcelain manufacturer with an international reputation. After 280 years of production and a number of owners, Rörstrand finally closed its doors in 2005. In 2007, Fiskars bought Iittala, which included the Rörstrand brand. courtesy of: mischer'traxler studio Wood vessel This plywood pot is normally part of a large installation. 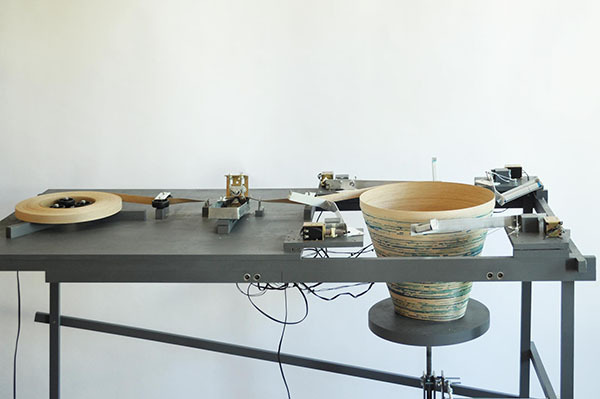 The installation is set up in such a way that a machine with all the components to complete the building of the pot operates while the public looks on. The number of components operating at any one time depends on the number of people looking at the work. Colours, materials and glues are all applied separately. Therefore, the creation of the work results from the participation of a collective audience. As soon as one person approaches the piece and looks at the machine, the production process starts. A wooden 24mm wide veneer-strip is pulled through a glue basin and slowly coils up around a 20mm thick wooden base. As the turning platform moves downwards, the veneer strip slowly builds a basket. A mould is not needed since the material supports itself and does not collapse when being coiled up. As soon as somebody else joins to look at the process, colour is added to the veneer via a marker. This interaction is possible owing to sensors in the frame of the machine. If one person watches, one sensor is activated and the machine starts winding. When two are activated, a marker with a light tone colour is pressed to the veneer to colour it. A third person and subsequent sensor result in one more marker colouring the work with a darker colour. This increases to four markers working at the same time. Katharina Mischer (1982) and Thomas Traxler (1981) co-founded mischer'traxler studio in 2009. They both completed BAs in product and furniture design at the New Design University in St Pölten, Austria, and at Kingston University in London, before going on to do MAs in conceptual design in context at the Design Academy Eindhoven. Based in Vienna, mischer'traxler studio designs objects, furniture, processes, installations and more. It focuses on experimentation and conceptual thinking within a given context. courtesy of: MACBA - Museu d'Art Contemporani de Barcelona Ceramic vessel This flattened, ovoid-shaped vase with a wide centre and thin base and opening is representative of Antoni Cumella’s exploration of form, three-dimensionality, space and rotation. A matt, ochre-red glaze covers a light, earth-coloured glaze. Cumella’s architectural approach to ceramics offers a contemporary take on glazed stoneware. 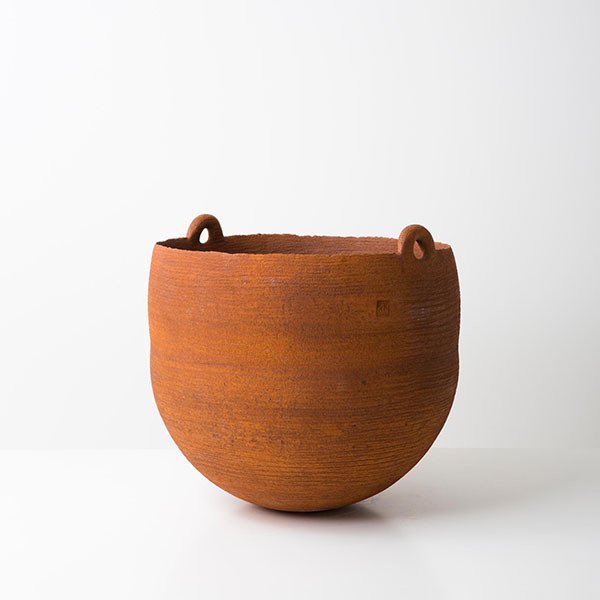 During his early career, Antoni Cumella maintained a traditional approach to ceramics. However, in 1953, he began experimenting with glazed ceramic plates. This rapidly evolved into innovative ceramic sculpture and ceramic murals that would challenge the established language of ceramics. Cumella’s experiments with textures and tones through the use of glazing led him to break the barriers of ceramics to bring them closer to architecture and painting. He co-founded the FAD Art School in Barcelona. Antoni Cumella (1913-1985) was a Spanish ceramicist from Barcelona. His stepfather taught him the basics of this art from an early age and Cumella participated in his first exhibition at the age of 15. The International Exposition in Barcelona in 1929 introduced him to the works of artists such Mies van der Rohe and Manolo Hugué. He then took evening classes at the Escola del Treball in Barcelona, where he became familiar with the works of Gaudí. Cumella began teaching ceramics at the Grup Escolar Lluís Vives in Barcelona in 1935. He held his first major exhibition in 1955 at the newly opened Museo de Arte Contemporáneo in Madrid, and soon after held his first international exhibition in Bonn, Germany, alongside Joan Miró. courtesy of: Hayon Studio Ceramic vessel Two white monkeys casually sit on the opening of a porcelain vase, their tails dangling down the side. The vase, designed by Virginia González and made by Lladró, is reminiscent of Chinese porcelain designs. A thick purple base provides a foundation for the rounded body of the vase to rest on. White pyramid-shaped porcelain forms protrude from the green surface of the vase, which is covered in white floral patterns. These lend a seemingly rectangular quality to the object. The playful, fantasy quality of the design contrasts with González's artistic detail. During the 1960s, Lladró introduced a ground-breaking firing technique that reduced its production process to one firing instead of three. A side effect of this was the creation of a pastel colour that has become emblematic of the company's work. The late 1960s also marked Lladró’s breakthrough in the North American market and the following decade the creation of their first limited series and the use of grès porcelain stoneware. The strong and earth-toned nature of this material opened up a number of creative possibilities, enhanced by the greater colour range of the porcelain sculptures. To this day, the company continues to push the barriers and innovate as much in material research as in its ground-breaking designs. Brothers Juan, José and Vicente Lladró made their first porcelain creations in a furnace built in their own home near Valencia in 1953. They started out creating vases and jugs, but in 1956 began producing figurines, which would become emblematic of the Lladró brand. At the end of the 1950s, Lladró opened its first store in Valencia. The 1960s saw the establishment of a recognisable style, characterised by its elongated lines and forms. With the increasing mastery of their production techniques, the pieces progressively became more complex, sometimes challenging the limits of porcelain. Lladró has not only created an internationally recognisable and innovative design and style but also researched and innovated firing techniques that have earned the company numerous awards. Lladró porcelain figurines can be found in homes and museum collections around the world. courtesy of: BD Barcelona Design Ceramic vessel Showtime 10 is a series of varying-shaped, figure-like vases made of white porcelain with small circular holes on the surface and a larger hole at the top. For the tenth anniversary of the Showtime collection designed by Jaime Hayon for Lladró, this new series has been created using a new shade of white enamel, with some of the circles on the surface gilded in 24-carat gold. Lladró porcelain is still hand-made in Valencia, Spain. Since its creation in the 1950s, the company has constantly adapted to the contemporary world and diversified its products, such as its ranges of lighting and jewellery created at the turn of the millennium. Up to 32 varieties of porcelain clay are made in the Lladró workshops by combining minerals such as kaolin, quartz and feldspar. Spanish artist-designer Jaime Hayon (1974) studied industrial design in Madrid and Paris. He joined the Fabrica design and communication research centre in Treviso, Italy in 1997, where he headed the design department until 2003. He then set up his own design studio and is now an internationally acclaimed designer. His knowledge of the artistic crafts has enabled him to push the boundaries of many media, resulting in numerous and varied collaborations with traditional companies such as Baccarat, Choemon, Bosa and Lladró, collaborations that emphasise and embody his dedication to the preservation and transmission of artistic craft skills. courtesy of: Musée Ariana - Musée suisse de la céramique et du verre Glass vessel This vase, created in 1900, is an outstanding example of the Art Nouveau style. The opening of the vase, coloured with an iridescent cobalt blue, gradually fades into shades of oil-like green at the base of the vase. The green then merges with an organic-shaped bronze mount that grows into two handles. Very few manufacturers were able to perfect this combination of blue-green cobalt and bronze. Towards the end of the 19th century, under the management of Maximilian von Spaun and working with the leading designers of the time, the Johann Lötz Witwe glassworks became increasingly successful. The company participated in numerous exhibitions, receiving a number of awards at the 1889 Exposition Universelle in Paris. At an exhibition in Bohemia in 1897, von Spaun discovered the works of Tiffany. These left a lasting impression on him, prompting him to orient new works towards the Art Nouveau style. The years leading to the Art Deco style were not so favourable. A combination of poor management, accidents and the devastating effect of the First World War saw a decline in the company’s innovation on both the technical and design fronts, leading to a decline in sales. Johann Lötz Witwe was a glass factory founded in 1836 in Klostermühle and bought in 1850 by Frank Gerstner and his wife, Susanne, the widow of Johann Lötz, a glassmaker ("Witwe" means widow in German). The factory was one of the most important factories in what is now the Czech Republic and enjoyed international fame. It began by grinding glass but later switched to producing coloured glass. Around the turn of the 19th century, the factory started to explore close collaboration with Viennese artists and designers such as Josef Hoffmann and Koloman Moser. It enjoyed growing success in the early 20th century, but the First World War saw a sharp decline in productivity, and the redrawing of national borders after the Second World War marked the company's demise. 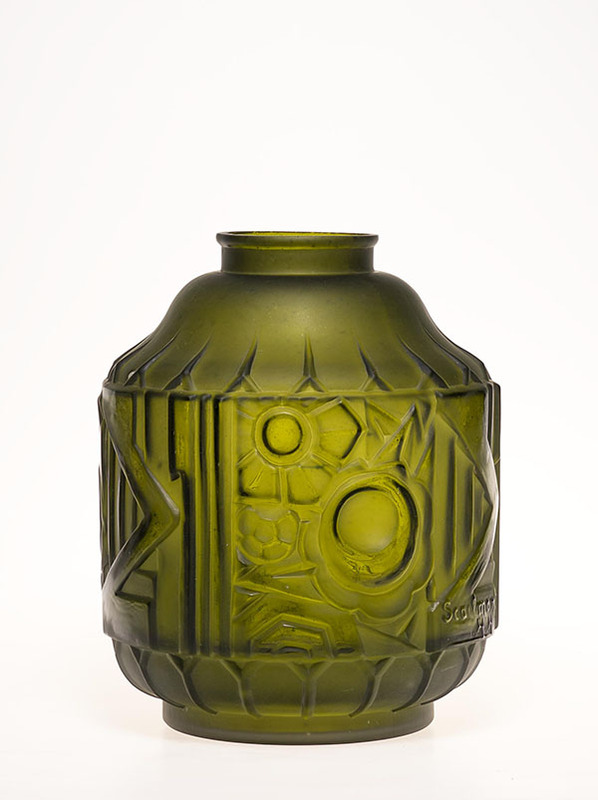 courtesy of: Galerie Bruno Bischofberger AG Glass work Designed in 1946, this light-green, free-blown lead crystal glass was cut and engraved by Riihimäen Lasi Oy. 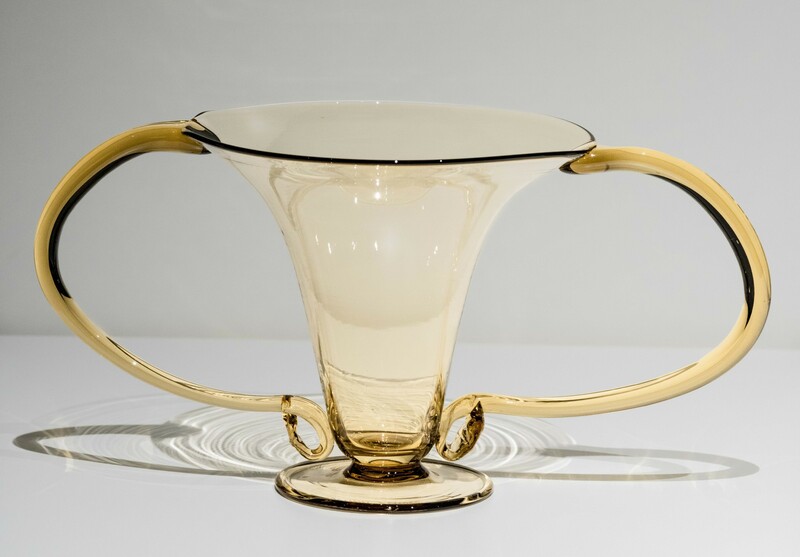 The intertwining lines of Baroque are emblematic of the designer Gunnel Nyman's work, which sought to focus on the various features of glass itself. Gunnel Nyman was very interested in the quality of light captured through glass. 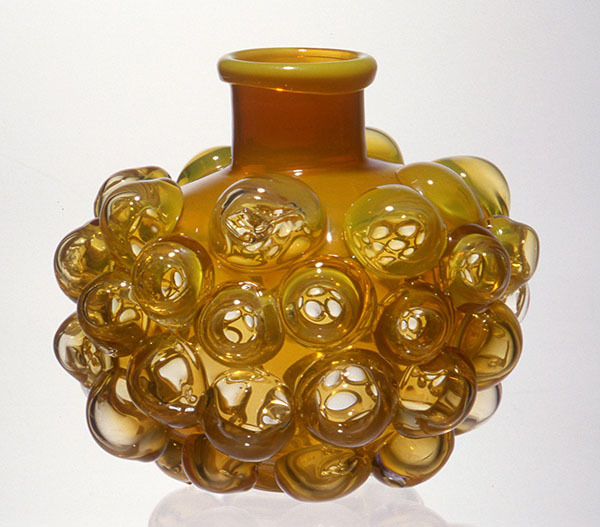 From the 1930s, she started to incorporate bubbles in her glasswork, and in the following decade her designs would systematically use evenly-sized and distributed bubbles. Riihimäen Lasi Oy was a glassware company based in Riihimäki, Finland and established in 1910. The factory began by producing domestic glass and glass containers and then diversified to making also glass bottles and windows. The factory worked alongside many acclaimed designers such as Gunnel Nyman, Greta-Lisa Jäderholm-Snellman and Aimo Okkolin, producing basic to high-quality glassware and, later, cut glass. After merging with Kaukalahti in 1927, the company became the largest glass factory in Finland. The name was officially changed from Riihimäen to Riihimäen Lasi Oy in 1937. The company changed owners a number of times before closing its doors in 1990. Gunnel Nyman (1909-1948) was a Finnish glass and metal artist. Born in Turku, Finland, she moved to Helsinki in 1922, studying furniture design there at the Central School of the Industrial Arts. Although trained in furniture design, Nyman also produced a number of lighting designs and created metalwork for clerical use. She gradually turned her attention to glassware and became a leading figure in modern Finnish glass design and a proponent of early mass-produced glassware. 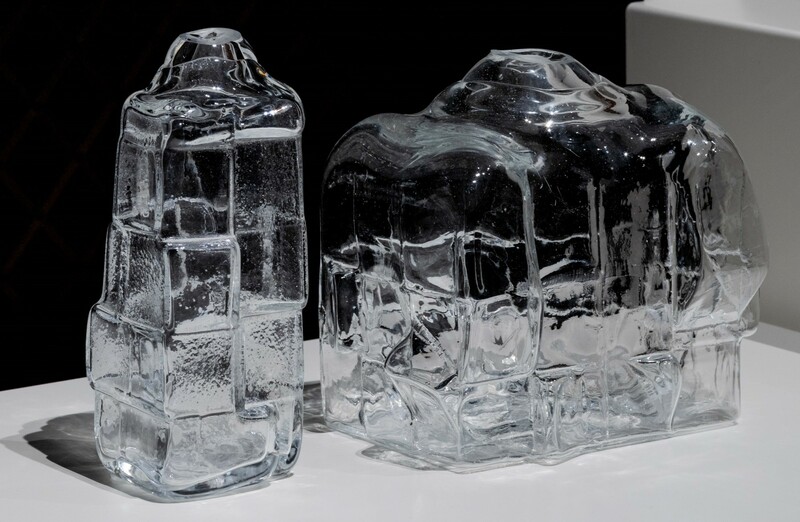 courtesy of: Galerie Bruno Bischofberger AG Glass Sculpture Paadarin Jaa (Paadar’s Ice) was designed by Tapio Wirkkala and produced by Finnish glassmaker Iittala in 1960. The piece is made up of two blocks of colourless cast glass. The sides show a constant linear pattern that runs from the top to the bottom of the sculpture. The surface of the top seems to sink into the glass itself, creating a melted glass effect. Iittala’s modern history is closely intertwined with that of design. As director in 1946, Antero Järvinen organised a competition in Stockholm that comprised not only glassworking techniques but also glass design. Tapio Wirkkala won first place and Kaj Franck second and third place. Järvinen hired both Wirkkala and Franck as designers and, more importantly, gave them full creative freedom. 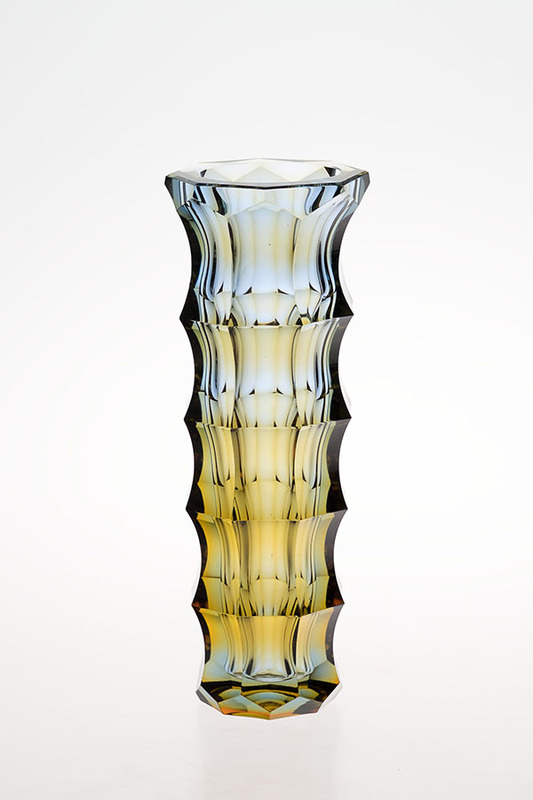 From the late 1940s, Järvinen had them focus primarily on glass art, while other designers created glassware designs. Refraction of light became an integral feature of their work and of Iittala’s glassware. Within ten years, the design of the glass produced by the company had changed radically, placing it at the forefront of innovative Scandinavian glass design. Originally a glassworks company founded in 1881, Iittala has grown to become one of Finland's leading brands, working alongside designers at the forefront of Scandinavian design, such as Kaj Franck and Alvar Aalto. The company specialises in tableware and cookware and has a rich heritage of glassware designs. The company has diversified from glass to other materials such as ceramics and metal. Tapio Wirkkala (1915-1985) was a Finnish designer and sculptor. His range of designs was immense, from glassware and jewellery to furniture and even a Finnish banknote introduced in 1955. As well as designs for mass production, Wirkkala created individual sculptures in a number of media. He gained international recognition after his success at the 1951 and 1955 Milan Triennale. Wirkkala worked with a number of internationally recognised brands, including Levi’s design studio in New York, the German porcelain manufacturer Rosenthal and Murano glass manufacturer Venini. courtesy of: Bischofberger Collection Glass vessel This globular glass vase shaped like a bunch of grapes with a cylindrical neck is emblematic of Kaj Franck’s pursuit of creating universal, combinable tableware. Simple is beautiful. This in many respects defines Kaj Franck’s understanding of design throughout his career and has had an significant impact on Finnish as well as Scandinavian design. He studied basic forms endlessly, always keeping special proportions in mind. Franck used mass production techniques to create practical low cost series of glassware accessible to the greater public. Established in 1793 in Urjala, Finland, Nuutajarvi Notsjo originally produced glass windows and bottles. The company changed hands a number of times until it was bought by the Wartsila Group in 1950. Kaj Franck was appointed artistic director, holding the position until 1976. The company has employed numerous ground-breaking designers. It merged with Iittala in 1988 and its wide array of glass objects are currently marketed under that name. Kaj Franck (1911-1989) is a quintessential reference when talking of the origins of present-day Finnish design. His works stimulate the senses and provoke emotions beyond that of aesthetic appreciation. His pursuit of creating universal, functional, combinable tableware stripped of unnecessary decoration has been an inspiration for contemporary minimal design. Moderation, ecology and equality were Franck’s principles. He strove to minimise the number of everyday objects we need in our lives, drawing attention to the sustainability and life cycle of products. He taught at the Helsinki School of Art and Design and his work earned him international acclaim and numerous awards. 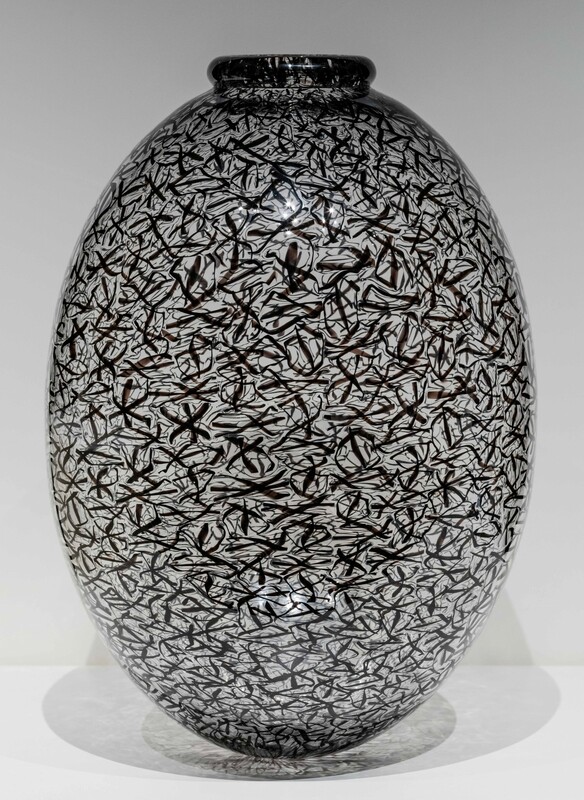 courtesy of: Musées d’Art et d'Histoire de Genève Metal vessel The rippled texture of this tall ovoid container gives the vase its name: Vase Peau de Serpent (Snakeskin Vase). Covered in a gold-black snakeskin-like decoration, the fascinating construction of the vase echoes the naturalistic trends of Art Nouveau. Jean Dunand first trained as a sculptor, but a chance encounter with a coppersmith in his native Geneva introduced him to copper and bronze techniques. Copperwork quickly became his preferred vocation, and hungry to broaden his knowledge of this form of work, he would supplement the surface of the metals he worked on with noble materials. The technique of lacquering developed in the Far East, in particular China and Japan. Dunand’s fascination with these cultures explains his tendency to cover his creations with his signature reptile-skin metal surfaces. His designs first tended towards the organic Art Nouveau style, but the lines became progressively stricter and more geometric, placing themselves in the Art Deco style. Jean Dunand (1877-1942) was a Swiss/French bronzesmith, sculptor and interior designer who is widely recognised as one of the greatest lacquer artists of his generation. His work developed at the height of the Art Nouveau movement and gradually merged into the Art Deco style. He began studying sculpture at the Geneva School of Industrial Arts at the age of 14. Having gained his diploma in 1897, Dunand moved to Paris to study at the National School of Decorative Arts. He remained in France and worked with a Japanese lacquerer to learn some of the ancestral techniques that had been lost in France. courtesy of: Musées Royaux d’Art et d’Histoire de Bruxelles Ceramic vessel Designed by Charles Catteau and manufactured by Faïencerie Boch in La Louviére in 1927, this vase is characteristic of Art Deco design. 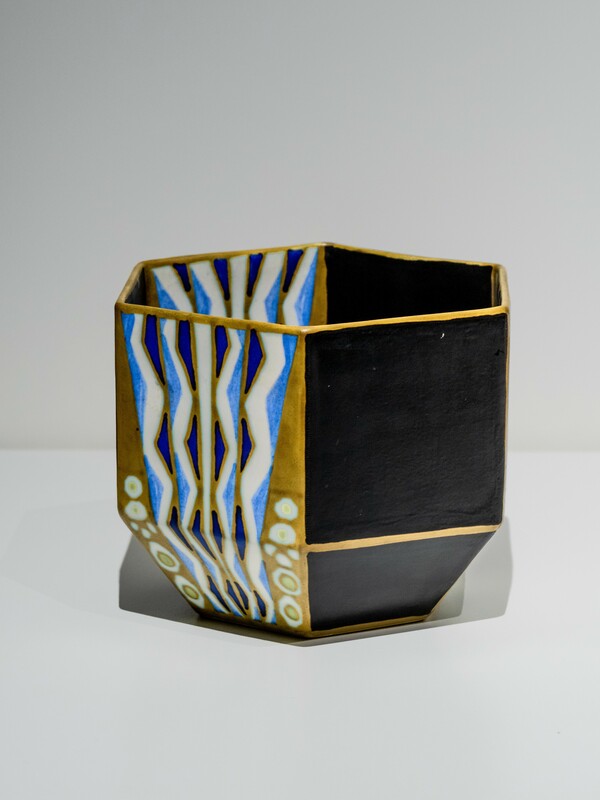 It is part of a composition of six ceramic receptacles, with brightly coloured wavy lines contrasting strongly with the black base. The piece is reminiscent of tribal masks and characteristic of the artistic philosophy of Primitivism, prevalent at the beginning of the 20th century. Charles Catteau was appointed head of the decorative department of Faïencerie Boch at the age of 27. To begin with, his designs remained quite traditional, tending towards Delft decoration and floral motifs. His breakthrough as a designer came after the First World War with the advent of Art Deco. He completely transformed the shapes, glazes and decorative style of the factory. His style became much more recognisable and personal, growing increasingly geometrical and taking inspiration from designs and cultures outside Europe. Catteau introduced a number of technical innovations to the factory, such as the use of the porcelain stoneware that became his preferred medium, as well as brightly coloured enamels and colour-contrasting patterns. Royal Boch - Keramis is an earthenware company in La Louvière, Belgium. The company was founded in 1841 and marketed its products under the name Keramis. The company saw rapid success, growing from 250 workers in 1893 to almost 1,000 in 1900, reaching a peak of 1,350 by 1936. The company hired Charles Catteau as a designer in 1906 and appointed him head of the decoration department a year later, when he was only 27. He renamed the department the Fantasy Workshop in 1920. The company changed names and owners a number of times. Charles Catteau (1880-1966) was a French Art Deco designer. He first trained at the National Ceramics School in Sèvres and then at the National Porcelain Factory in the same town. In 1906, he moved to La Louvière in Belgium, where he started to work at the Faïencerie Boch. The following year, he was appointed head of the earthenware factory's Decoration Department, a position he held until his retirement in 1948.
courtesy of: Museum Kunstpalast (MKP Glas Glass vessel Floral designs decorate the sides of this thick dark green cylindrical vase designed by Henri Heemskerk and manufactured by SA Verreries de Scailmont in Belgium in 1930. The organic shapes of this Art Deco vase have been cut out by sandblasting. SA Verreries de Scailmont worked alongside other major glassworks, such as Boch Frères and Val Saint Lambert. It created designs for these companies and later established a firm reputation as a Belgian pressed-glass manufacturer. Pressed glass involves mechanically pressing molten glass into plain or engraved moulds. This technique differs from glass grinding in that it produces rounded edges rather than the sharper edges of ground glass. Scailmont specialised in the production of both ground glass and pressed glass. Scailmont was a Belgian glassworks company established in Manage in 1901 by H.R. Hirsch. In 1924, the company opened a department specialising in non-crystal decorative glass headed by Henri Heemskerk and directed by Charles Catteau. The two became the company’s most distinguished designers. The company went through a period of great success in the 1920s and 1930s, employing over 800 people at its peak. It merged with Durobor in 1976, taking the name Hainaut and later Vereno. Scailmont is associated in particular with satin-finished glass in the Art Deco style. Henri Heemskerk (1886-1953) was a student of Charles Catteau and strongly influenced the production of Art Deco ceramics in Belgium. He first worked as director of the painting studio at Scailmont, but his designs were quickly used in glassware. Often working alongside Catteau, Heemskerk produced works made from moulds or blown pressed glassware, with the surface sandblasted or acid etched. courtesy of: Museum Kunstpalast Glass vessel This red, rock-shaped vase was created by the German company Ingrid Glas in 1960. 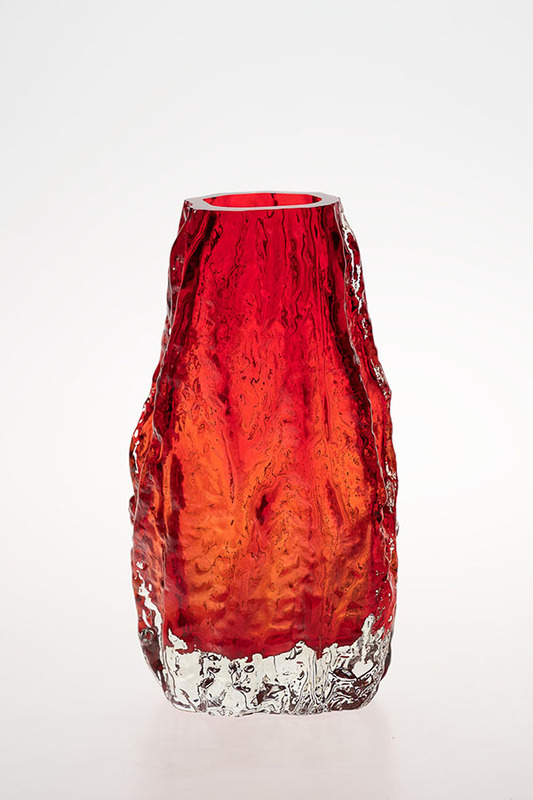 The base of the vase is made of colourless glass and the upper part is a thick but translucent red colour. Little is known about this German-based company which started production in the 1960s and closed in 1979. Among other glass pieces, Ingrid Glas is well known for its variety of textured bark vases. courtesy of: Sparkassenstiftung Schleswig-Holstein Ceramic vessel This black ceramic vase was created by Barbara Stehr in Germany in 1976. Barbara Stehr is a German ceramicist born near Hanover in 1936. She studied at the School of Applied Arts in Hanover from 1957 to 1958, going on to study first painting at the College of Fine Arts in Hamburg and then ceramics in the workshops of Bontje van Beek and Otto Lindig. Barbara opened her own studio in 1961, and in 1970 started working as a designer for the Søholm stoneware and faience factory in Denmark. She has also taught at the College of Fine Arts in Hamburg and the University of Applied Science in Rhineland-Palatinate. 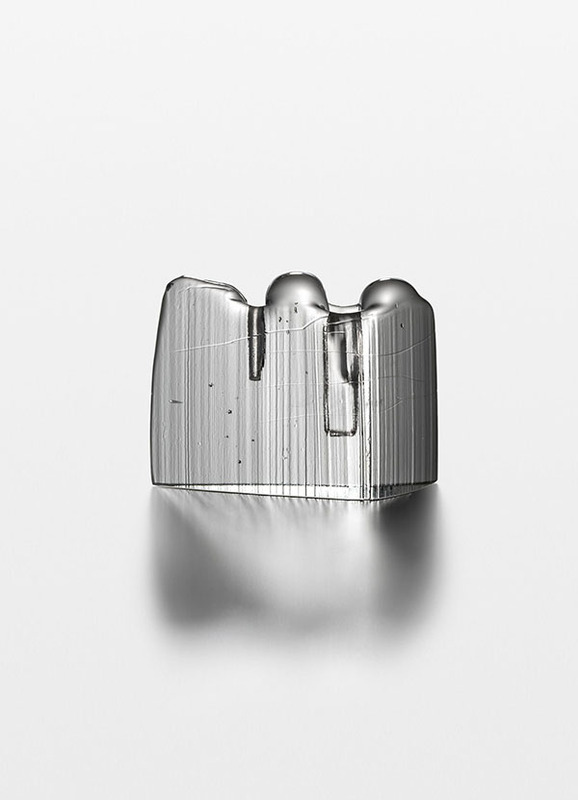 courtesy of: Studio Hanna Krüger Glass vessel The form of an antique vase is first photocopied. This results in a blurry outline evoking the essence of the original shape. Designer Hanna Krüger then asks ceramicists and glassworkers to create works based on the photocopy. This branching colourless vase is the fruit of this open interpretation. Hanna Krüger was born in Berlin in 1979 . She studied at the Kunsthochschule (Academy of Fine Art) in Kassel, Germany, between 2005 and 2011. She is a product designer, focusing mainly on furniture and exhibition architecture. She opened her own design studio, Studio Hanna, in 2011. Her unique conceptual works have been exhibited in museums and galleries both in Germany and internationally. 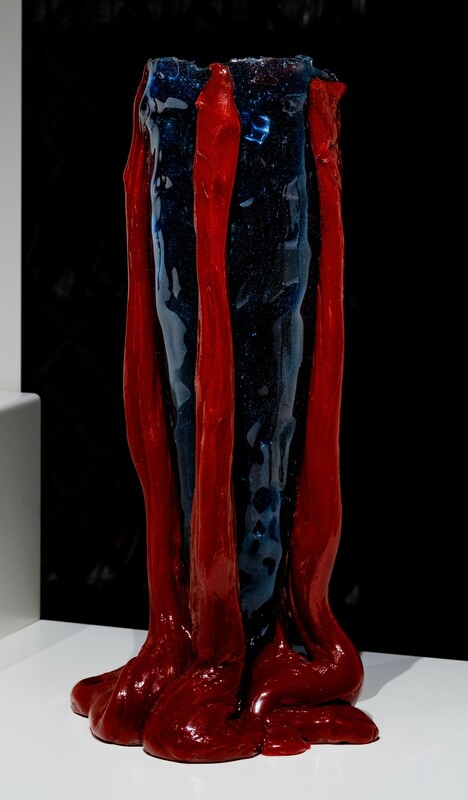 courtesy of: Museum Kunstpalast Glass vessel This tulip vase in the Art Nouveau style decorated with Lötz cobalt Papillon stained glass was created by the Johann Lötz Witwe glassworks in 1899. Colourless glass has been underpinned with colours. Maximilian von Spaun, owner of Johann Lötz Witwe glassworks was introduced toTiffany glass at an exhibition in 1897. The discovery had a profound impact on him, as can be seen from the works subsequently produced. The factory had previously bought patents for iridescent colouring, and now applied this to their new Art Nouveau series, exemplified by its works using cobalt Papillon stained glass. The factory produced glass that was similar to Tiffany's not only in colour but also in design, and sold them at a much lower price. However, accusations of plagiarism pushed the company to create its own designs, such as the Phänomen series, which proved to be its masterpiece. 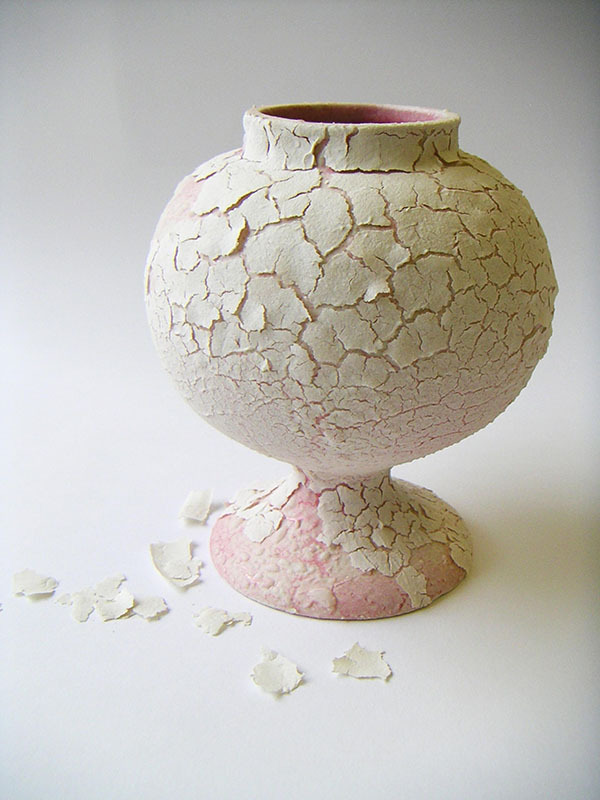 courtesy of: Tamsin van Essen Ceramic vessel White slip-clay, applied to the surface of a low-temperature pink glaze, peels off a slip-cast earthenware ceramic apothecary jar. The peeling effect emulates the symptoms of a common skin disease, Psoriasis. The jar is based on a 17th–18th century design. Tamsin van Essen's series entitled Medical Heirlooms explores the stigma of disease, questioning contemporary obsessions with perfection and beauty. She has been manipulating ceramic material in a way that emulates physiological processes, deliberately encouraging "faults", "defects" and "blemishes". These features add visual and tactile interest to the vessels and aim to reflect the interest and individuality that can be added to a person’s appearance by scars, flaws or deformities caused by medical conditions (their health legacy). Based on apothecary jars of the 17th and 18th centuries, the forms have strong historical and medical links, as well as providing the metaphor of the vessel as body. They become containers for disease, rather than holding the cure. As family heirlooms, the jars can be passed down through generations in the same way as hereditary medical conditions. The jar is made of white earthenware in a plaster mould. The surface of the fired jar is covered in a pink glaze fired at a low temperature. Need to find out if the ceramic was fired before or after the glaze was applied. British artist Tamsin van Essen works primarily in ceramics. She completed a BA in ceramic design at Central Saint Martins between 2004 and 2007, and an MA in ceramics and glass at the Royal College of Art in London between 2010 and 2012. Her work is mainly concept driven, exploring notions of beauty and impermanence through scientific, medical and social-historical themes. Material experimentation is a distinguishing feature of her work, probing the technical properties of ceramics and the limits of its behaviour. Tamsin has exhibited her work internationally, including at Sotheby’s and the Saatchi Gallery in London, the Palais des Beaux-Arts in Brussels, Design Miami, the Nobel Museum in Stockholm and the Musée National de Céramique-Sèvres in Paris. Her works feature in a number of public and private permanent collections. courtesy of: Marc Newson Ltd Ceramic vessel This Delft Blue tulip vase is part of the One Minute Delft Blue collection designed by Marcel Wanders. With abstract motifs, the vase combines modern design and traditional craftsmanship. When Joost Thooft took over management of De Koninklijke Porceleyne Fles, more commonly known as Royal Delft, in 1876, he worked on improving the production process, to ensure high standards of quality. The procedures he put in place endure to this day. The production process starts with the composition of the clay, made from ten raw materials, including kaoline, chalk feldspar and quartz. This takes a liquid form, which is then poured into plaster moulds. The moulds are left to dry, and after a certain time the object is taken out to be air dried. It is then sprayed with a layer of liquid clay and fired at 1160°C, resulting in biscuit. Lastly, the object is hand painted using a black paint containing cobalt oxide that turns blue when fired. It is then covered with a colourless glaze and fired at 1200°C, transforming it into a typical Delft Blue ceramic object. The Koninklijke Porceleyne Fles, more commonly known as Royal Delft, is the last of the 32 earthenware factories established in the Dutch town of Delft in the 17th century. The company was created in 1653 by David Anthonisz van der Pieth, who converted his house into a factory. The company changed hands soon afterwards. Then, owing to a sudden drop in availability in Europe of chinaware imported from China, Delft earthenware rapidly grew in popularity. The rise of another earthenware producer in Europe was likely the cause of the decline of Delft ceramics in the 19th century, and Royal Delft is the only factory that is still active today. Delft Blue grew as a very popular alternative to Chinese porcelain in the 17th century. The clay is coated with a glaze that renders the pottery white, this in turn is covered with blue motifs. 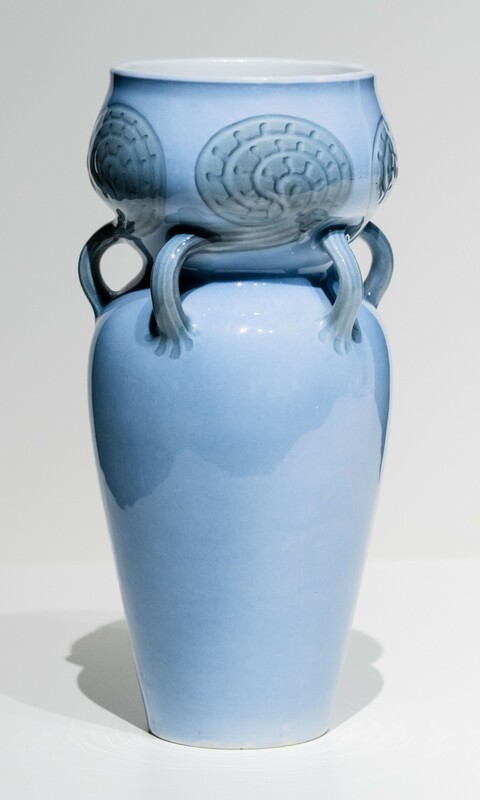 courtesy of: Danam Antik Ceramic vessel Danish porcelain manufacturer Bing & Grøndahl made this blue ceramic vase in 1900. The vase is composed of two sections. The base, which resembles that of a classic vase, is cut off at its opening by a second bowl-like segment. These two sections merge through five handles. The green design of the handles merges with the upper part in a spiral shape. Historically, ceramics played an important role in Denmark’s economy. Clay is a natural resource in Denmark, and this made it an ideal material with which to create products. The ceramic industry in Denmark was the first in the country to produce contemporary product designs. Bing & Grøndahl was a Danish porcelain manufacturer founded in 1853. The tree towers that make up the manufacturer's trademark stamp originate from the Copenhagen coat of arms. The company’s emblematic dinnerware series with a seagull motif, created in 1952 by designer Fanny Garde, became known as the national service of Denmark in the 1950s, when a census discovered that one in ten Danish households owned one or several pieces of this collection. In 1987, the company merged with the Royal Porcelain Factory under the name Royal Copenhagen. courtesy of: Holstebro Kunstmuseum Glass vessel The minimalist colour range of this vase forces the viewer to focus on the texture and the shapes of the vessel. The black tones that resemble a flock of birds contrast sharply with the colourless glass. Worked in traditional Venetian techniques the overall style of the vase is evocative of the Scandinavian style. Mastery and use of traditional Venetian glassmaking techniques are a central feature of Tobias Møhl's work. However, when it comes to the design and creation, Møhl likes to use the Venetian techniques in a Scandinavian manner, as a means to convey his personal expression as an artist. Much in the way of Scandanavian design, Møhl's work explores and uses simple elements of glass to create objects refined in their minimalism. This hand-blown glass object has been finished using the Venetian murine technique. Danish master glassworker Tobias Møhl trained at the Holmegaard Glass Factory and Royal Copenhagen. He also attended a number of master classes in the United States. Tobias works use traditional Venetian techniques such as reticello, murrineand filigree. He combines his knowledge of traditional techniques with innovative designs and techniques. His works have been exhibited internationally and are found in numerous public and private collections. courtesy of: Manufacture nationale de Sèvres Ceramic vessel This vase is part of a series of vases designed in the early 1920s by Jacques-Emile Ruhlmann for the Manufacture Royale de Sèvres. The cone-shaped body of the vase is mounted on a gilded bronze cubic foot. The white porcelain interior is accentuated by its gilded edge. Jacques Emile Ruhlmann translated 18th- and 19th-century neo-classical motifs into geometrically formed contemporary designs that placed his work at the forefront of the Art Deco movement in France. His works were not extravagant in their design but often incorporated precious materials such as exotic woods, ivory or complicated lacquer. As a result, they were frequently expensive and out of the reach of the greater public. However, the post-First World War industries had created a wealthy economic class that had the means to purchase his works, ensuring his status as a leading designer. The stock market crash of 1929 and ensuing economic depression marked the end of this era. The Manufacture nationale de Sèvres is a leading European porcelain manufacturer. Since its creation in 1740, the factory has been closely linked to the the French political order. It was established with the support of Louis XV in order to compete with the porcelain manufactories in Chantilly and Meissen. The company then came under imperial and subsequently national management. It still produces works in accordance with its origins, that is, ceramic works using artisanal techniques. It reproduces iconic pieces using its rich collection of moulds, as well as contemporary pieces. The ceramics are produced both for state needs and for commercial purposes. Jacques-Emile Ruhlmann (1879-1933) was a French interior and furniture designer and a leading exponent of the French Art Deco style. Ruhlmann was born in Paris to parents who worked in the decorating business. However, it was not until he had completed his military service that he began to take an interest in the subject, designing and creating furniture from home as a self-taught artist. When his father died in 1907, he took over management of the family business. His increasingly Art Deco designs were heavily influenced by those of the 18th century. In 1919, Ruhlmann created Ruhlmann et Laurent with Pierre Laurent, specialising in the design and production of luxury home goods such as furniture, wallpaper and lighting made from exotic and precious materials. courtesy of: Centre International de Recherche sur le Verre et les Arts Plastiques - CIRVA Glass vessel This series of white and black hand-blown cylindrical glass vases was designed by Pierre Charpin and created with the assistance of the Centre International de Recherche sur le Verre et les Arts Plastiques (CIRVA) in Marseille. The vases are evocative of the minimalist and colourful style of the Memphis Group, with whose members Charpin worked in his early career. Pierre Charpin approaches glass from a radical stance, limiting the parameters to a single form, the cylinder. The cylinder is the simplest and most natural form created when blowing glass. The result is a series of vases with intense and variable harmonies of colour that play with transparency while evoking landscapes, views and perspectives. Through this series, Charpin develops a language through glass. Based in Marseilles, France, the International Centre for Research in Glass and Visual Arts (CIRVA) was created in 1983 in a former industrial building in the centre of the city. CIRVA is a research and production workshop hosting artists, designers and architects who wish to work on innovative projects with glass. For more than 30 years, CIRVA's technical team has worked with more than 200 artists on numerous projects in fields as varied as contemporary art, design and applied arts. The centre boasts a collection of some 750 pieces, which are exhibited in temporary and permanent collections in France and abroad. French-born artist and designer Pierre Charpin graduated from the Fine Art School of Bourges in 1984. Since the early 1990s, he has dedicated himself to furniture and object design. His practice revolves around experimental and research projects, working with the support of numerous institutions, including the Centre International de Recherche sur le Verre et les Arts Plastiques. Following his first solo exhibition in 1999, Charpin began producing limited series. He has also taught at the École Supérieure d’Art et de Design de Reims and at the industrial design department of the Cantonal School of Art in Lausanne, Switzerland. courtesy of: Baccarat Glass vessel The Darkside Oups! vase is a reinterpretation of the iconic Eurydice crystal vase, designed by Philippe Starck with characteristic imagination and humour. 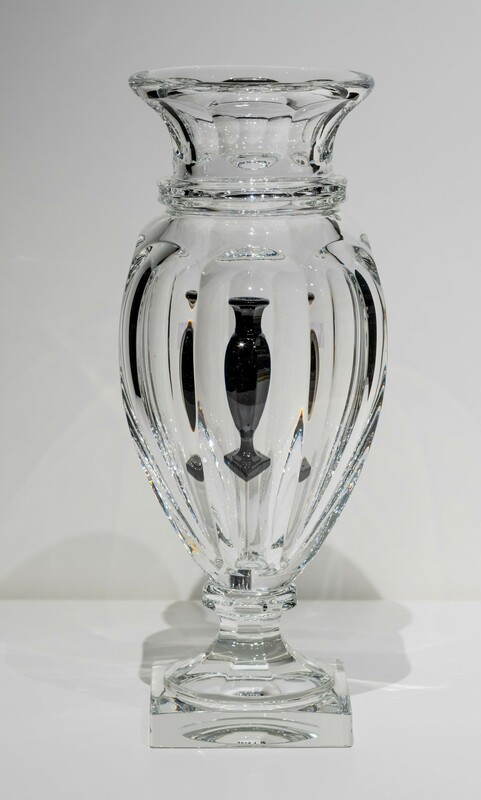 This vase within a vase has a tiny black crystal vase encapsulated in a large, transparent crystal vase. It is a poetic vase for a single flower, with surprising visual effects. From its inception, Philippe Starck’s Darkside Oups! project for Baccarat presented a complicated technical challenge. Most of the time, the black crystal will show defects and imperfections when manufactured. Placed in the centre of a colourless crystal vase, the black crystal creates increased refractions of light. 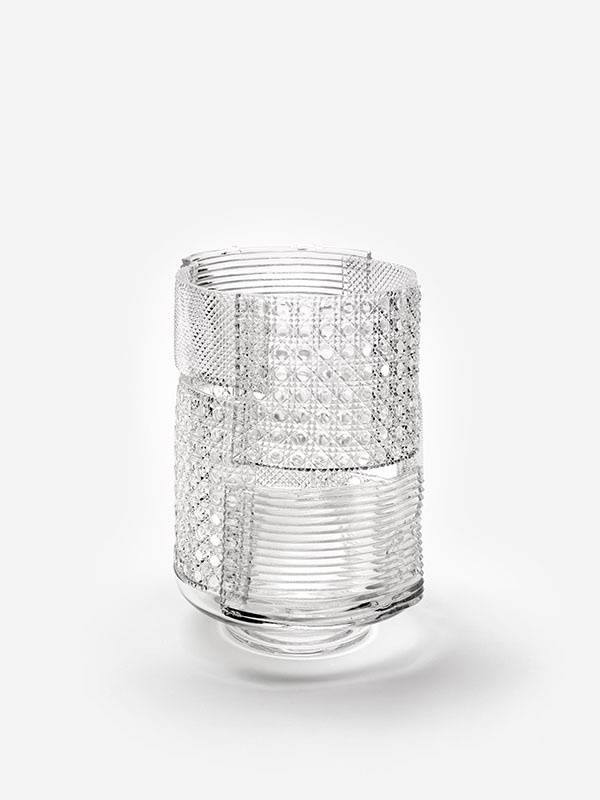 Philippe Starck Baccarat is a French crystalware manufacture located in the town of Baccarat in north-eastern France. The company was founded in 1764 when Louis XV of France allowed the creation of a glassworks factory that would initially produce window panes, mirrors and stemware. By the time the first crystal production started on the site in 1816, the factory employed over 3,000 people. State control of the company ended after the defeat of Napoleon III. Around this time, Baccarat started to import designs from Asia, in particular Japan, and to export its products worldwide. Perfume bottle production also grew significantly. In the late 1930s, the company began producing its works from scratch when it expanded operations to include acid and sandblasting. 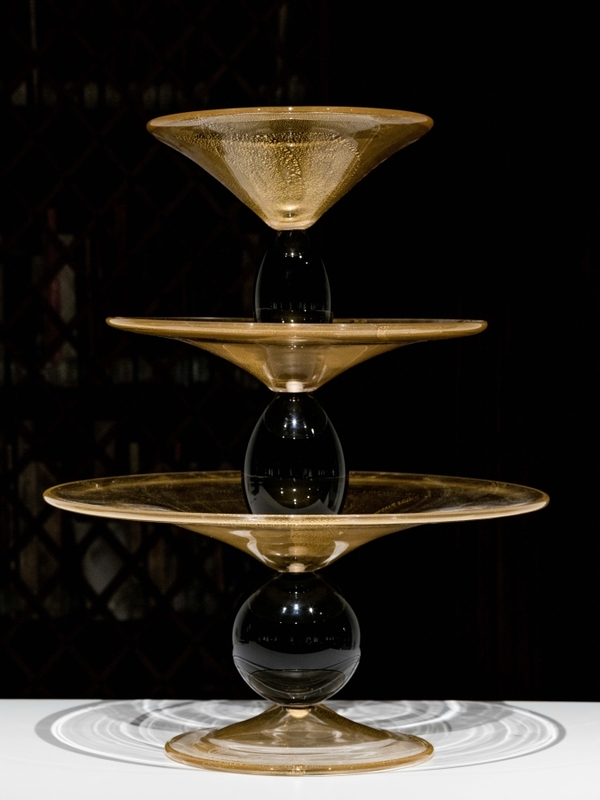 Today, Baccarat continues to produce high-quality crystal homeware using a rich heritage of techniques and designs, while embracing modern techniques and working alongside innovative designers. In the course of his career, Philippe Starck has designed over 10,000 objects, and still counting. Through his work, the Frenchman has a mission, a vision: that creation, whatever form it takes, must improve the lives of as many people as possible. To Starck, sharing his ethical and humanist vision of a more equal planet is a duty, if not a moral imperative, resulting in unconventional projects that bear surprising fruits. The purpose of his designs is evident: an object must be useful before being beautiful. His childhood spent beneath the drawing table of his aeronautical engineer father taught him an important lesson: everything should be organised elegantly and rigorously, in human relationships as much as in the concluding vision that presides over every creative gesture. Baccarat is a French crystalware manufacture located in the town of Baccarat in north-eastern France. The company was founded in 1764 when Louis XV of France allowed the creation of a glassworks factory that would initially produce window panes, mirrors and stemware. By the time the first crystal production started on the site in 1816, the factory employed over 3,000 people. State control of the company ended after the defeat of Napoleon III. Around this time, Baccarat started to import designs from Asia, in particular Japan, and to export its products worldwide. Perfume bottle production also grew significantly. In the late 1930s, the company began producing its works from scratch when it expanded operations to include acid and sandblasting. Today, Baccarat continues to produce high-quality crystal homeware using a rich heritage of techniques and designs, while embracing modern techniques and working alongside innovative designers. courtesy of: Galleri Format Oslo Glass vessel This transparent hand-blown glass sculpture was designed and made by Beate Einen in 2015. The glass vessel has been hand-blown and shaped. The interior of the vessel is gilded using gold leaf and the exterior surface of the vessel is covered with a sand-like pigment. This sculpture is part of a series inspired by legends of magic and alchemy. The glass was first shaped by hand and the surface was finished by adding sand-like pigments with a paintbrush. The inside of the vessel is gilded with gold leaf. The light from the gilded interior reverberates through the sculpture and is reflected off the exterior pigment-covered surface. To create this series Beate Einen studied the magic rituals of different cultures and how they were expressed through objects. She is particularly interested in the values that these objects gain over time, to the point that they sometimes give off a metaphoric golden glow. This series tries to recreate her fantastic vision of these “magical” objects. The glass vessel has been hand-blown and shaped. The interior of the vessel is gilded using gold leaf and the exterior surface is covered with a sand-like pigment. 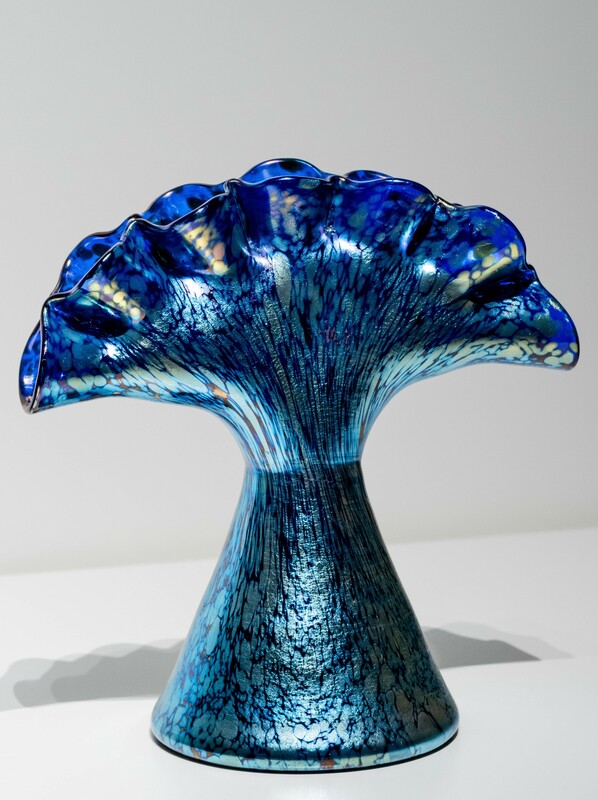 Born in 1979, Norwegian glass designer Beate Einen first studied 3D ceramic and glass design at the University of Central England between 1999 and 2000 before graduating with a BA in 3D glass design from the Surrey Institute of Art and Design in 2002. Beate continued her studies with a three-year training course in glassblowing at Kosta Glass School before completing an MA in glass design at the University of Sunderland. On finishing her studies in 2007, Beate founded her studio, Beate Einen Glass & Design. She hand-blows most of her creations but sometimes also works alongside master glassblower Micke Johansson. 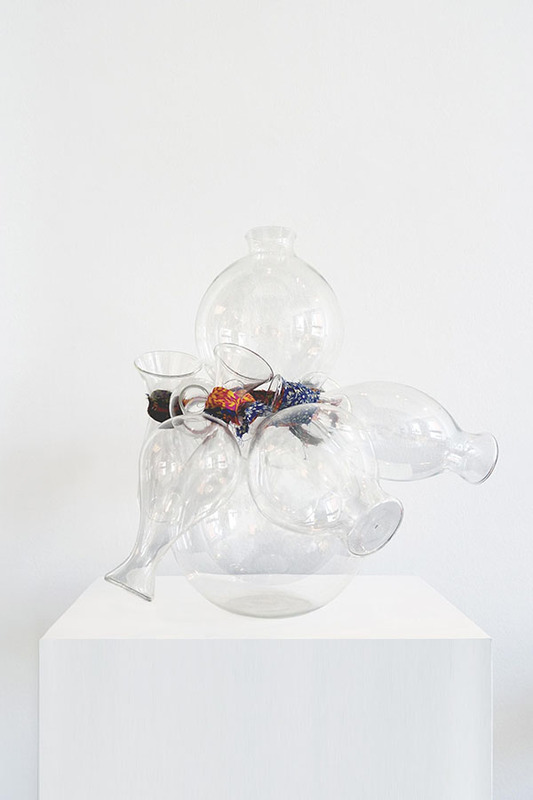 She produces functional objects such as glasses and dishes, as well as sculptural chandeliers and unique pieces. Her works are displayed in a number of galleries in Norway and in international exhibitions. 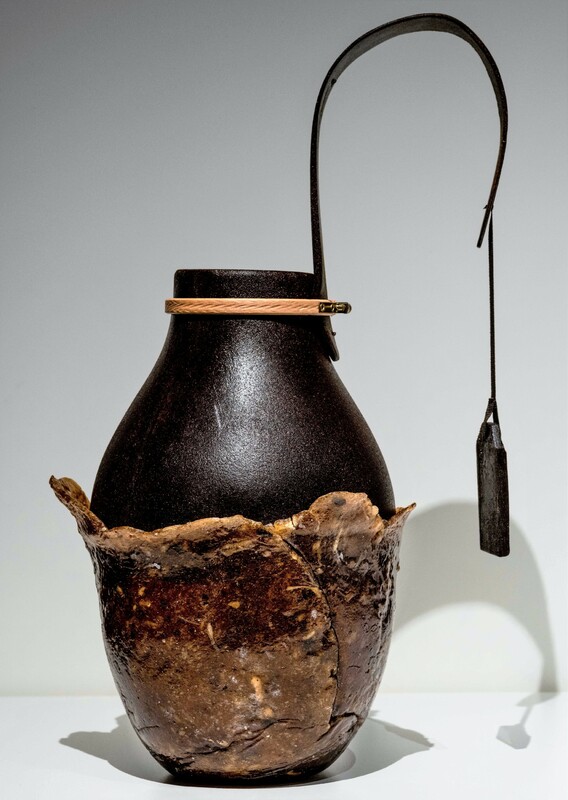 courtesy of: Studio Jeroen Wand Synthetic vessel This plaster vase is characteristic of Studio Jeroen Wand’s unconventional use of materials. 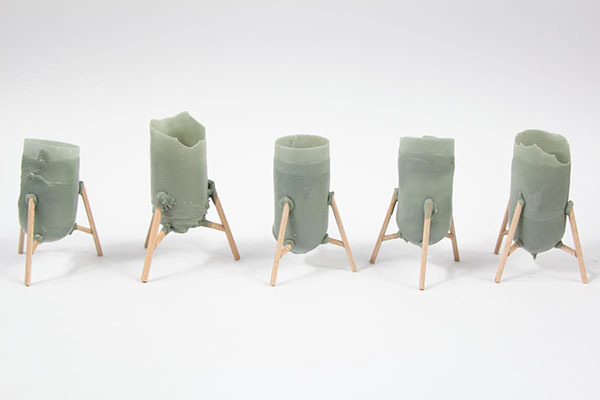 Combining paper, epoxy and plaster, it has created a fragile-looking yet sturdy vase. The vase is held in place by three wooden legs. Studio Jeroen Wand alters, reinvents and modifies traditional combinations of materials and techniques, culminating in unconventional production processes, such as paper laminating or plaster rotation moulding. The works of the studio are the result of experimentation and research, where the production method directly influences the form and function. Jeroen Wand founded Studio Jeroen Wand in 2008. The studio focuses on experimentation, reworking traditional combinations of materials and techniques in order to modify, alter or reinvent them, creating new materials from unconventional methods of production. The studio challenges the established order of what is beautiful or agreeable by exploring the dynamic and raw parts of design, as is seen in its work with paper laminating and plaster rotation moulding. Jeroen Wand is a Dutch designer born in 1985. He studied product design at the Academy of Fine Arts and Design in Maastricht and received an MA in applied arts from the Sandberg Institute in Amsterdam. 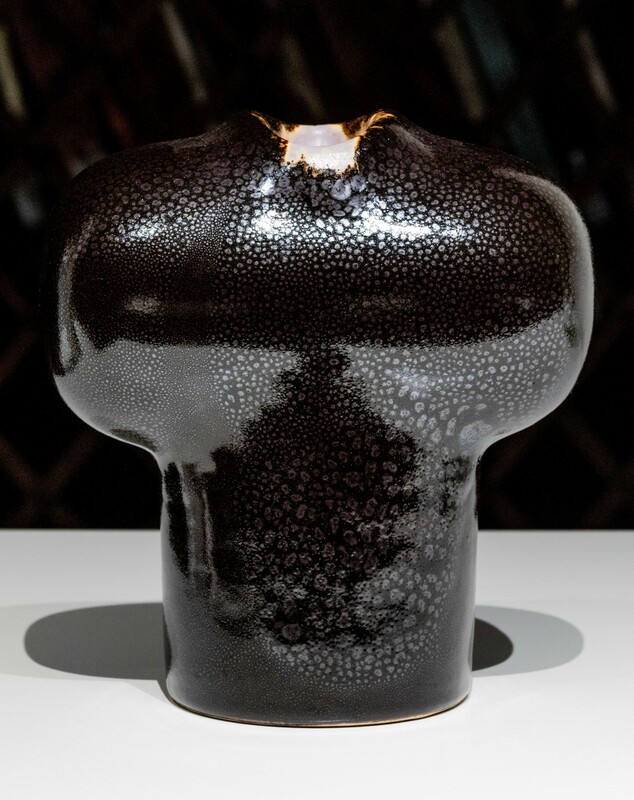 After graduating, he founded Studio Jeroen Wand in 2008.
courtesy of: Tomáš Libertíny Vase This vase, designed in 2005, is part of a series of vases made entirely by bees in 2006. The white sculpture forms the skeletal base of a body made exclusively of beeswax. For this work, Tomáš Libertíny created a vase-shaped beehive scaffold and thousands of bees then formed the vase and the perfect hexagonal structures that make up the honeycomb. The project took months of research and learning from beekeepers. The nature of this work presents conservation difficulties, as it cannot be exhibited in a space that is too hot, given the fragility and low melting point of beeswax. 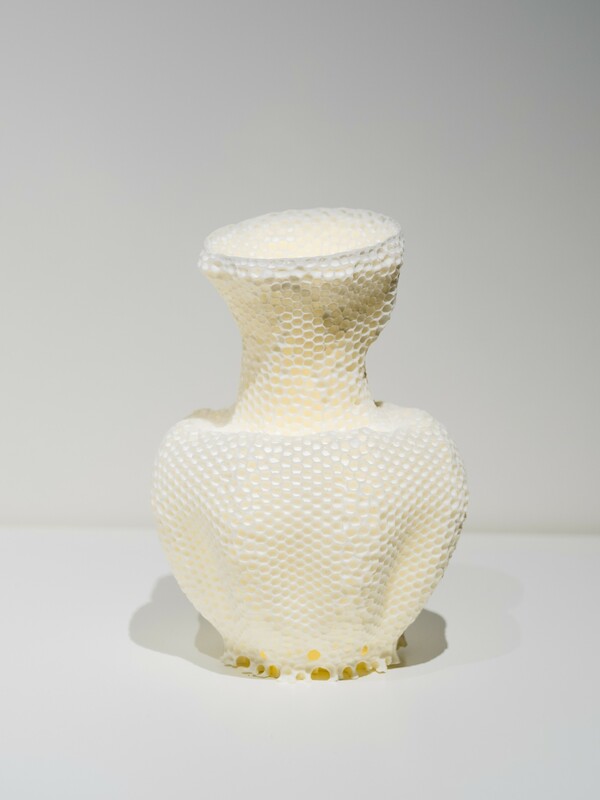 The artisan created a vase-shaped beehive scaffold, and thousands of bees then formed the vase and the perfect hexagonal structures that make up the honeycomb. Through his art, Slovakian artisan Tomáš Libertíny explores the beauty and intelligence of nature and questions existential issues of the human mind’s relationship with nature. He embraces present-day methods of production while acknowledging the vital role of the artist’s hand in his work. His awareness of patterns in nature are central to his drawings, paintings and sculptures. The last are executed with industrial precision but, paradoxically, controlled randomness is essential to their production process. Born in Slovakia in 1979, Tomáš studied engineering and design at the Technical University Košice in Slovakia and subsequently art and design at the University of Washington in Seattle. He continued to study painting and conceptual design at the University of Bratislava before completing an MFA at the Design Academy of Eindhoven, Netherlands. He currently lives and works in Rotterdam. courtesy of: Galerie Alain Daudet Synthetic vessel This classically shaped vase from Sebastiaan Straatsma's "Dust Collector" series was created in 2011. It is made from an epoxy resin and depicts a tree with pink-purple blossoms rising from the bottom to the top of the vase. The brown tree trunk, the green foliage and the pink blossoms contrast with the rest of the black patterned vase. 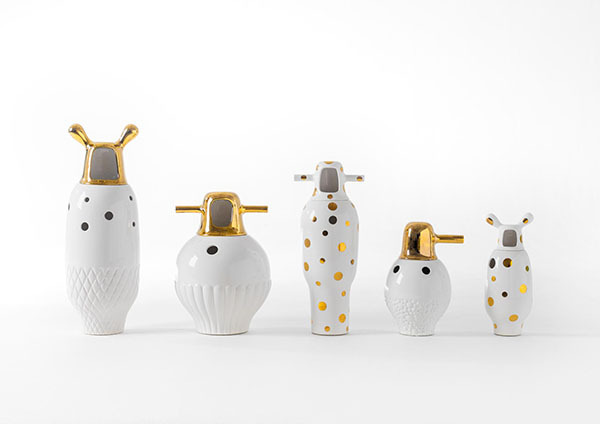 The "Dust Collector" series gets its name from the fact that Sebastiaan Straatsma has taken the design of a functional jar, perhaps used to hold condiments in the past, and reinterpreted it in a way that it completely loses its functionality and becomes more of a decorative, sculptural object. Straatsma likes to work with epoxy resin, a malleable yet ultimately strong material. He dashes and draws epoxy resin on the surface of moulds that he has made. Layer upon layer of the material can be applied, providing endless creative possibilities. 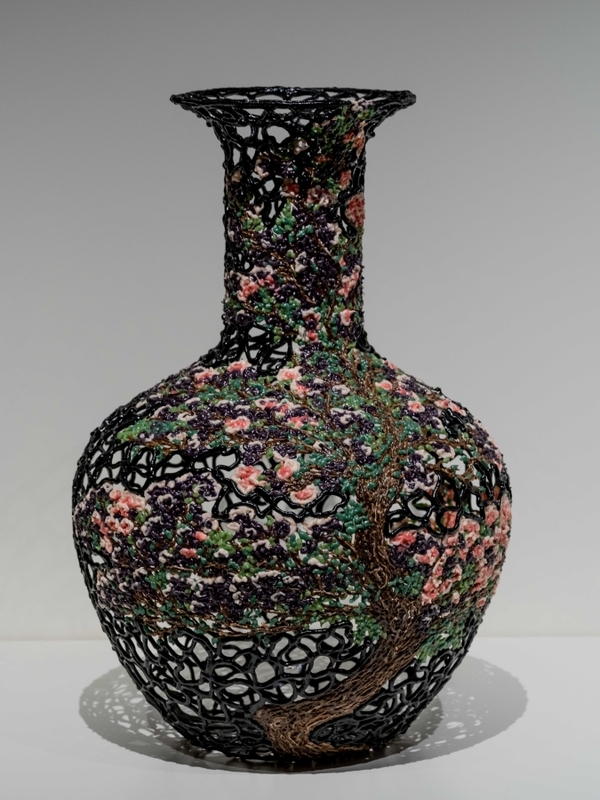 Sebastiaan Straatsma covers his vase moulds in highly decorative, intricate, multi-coloured “skins” using a syringe filled with his own secret formula of epoxy resin. Once the mould is removed, the epoxy shell stands on its own. Sebastiaan Straatsma both designs and produces his own pieces. Objects with historical and emotional value fascinate him, and he reuses and reinterprets these in his work. Since 2006, he has focused mainly on vases. He starts by reinterpreting a classical form, altering its purpose, design, material and history. To realise these works, Straatsma has developed his own innovative and unique technique using epoxy resin on the surface of moulds designed from classical forms. Between 1993 and 1999, Straatsma studied at the Design Academy Eindhoven, Netherlands. In 2000, he moved to Rotterdam, where he established a design studio, which he subsequently moved to Schiedam in 2003.
courtesy of: Galerie kreo Glass vessel This lamp is part of the Frozen in Time collection inspired by the extreme freezing that occurred in the Netherlands on 2 March 1987. The structure of the vase’s handles has been replaced with flowering tree climbers. The glass of the vase is finished in opaque white, reminiscent of frozen windows or dew. On 2 March 1987, the Netherlands was hit by extreme freezing rain, which brought the country to a standstill. For one day, everything was fused together by ice, producing wondrous and mysterious images. A day later, when the temperature rose again, the flowers resumed blossoming. The Frozen in Time collection is inspired by this extreme climatic event. Ice is a fascinating material: it preserves, conserves, protects, eternalises. A frozen item is still, white, encircled by silence, while within one suspects a vibrant life, waiting for the ice to melt. A moment in time. A moment within a process. For Frozen in Time, Studio Wieki Somers looked for a material that would have the appeal and the workings of ice. UV topcoat is a kind of durable ice: after it is exposed to sunlight, the material "freezes" into a solid hard layer. It connects all the separate components together in an enduring way. Dutch designers Wieki Somers and Dylan van den Berg founded Studio Wieki Somers in Rotterdam in 2003. The duo studied at the Design Academy Eindhoven in the late 1990s. Their creations are known for their attention to the materials, technological ingenuity and the introduction of fantasy to commonplace household objects. The studio provides an enlightened reading of the everyday environment. It collaborates with numerous international manufacturers, museums and galleries, and its works feature in museums such as the Museum of Modern Art in New York and the Centre Pompidou in Paris. courtesy of: Vitor Agostinho Glass Sculpture This jar was made using a mould construction by overlapping plaster blocks, in a controlled as well as random way. The main goal is to explore creative factors, such as fortuity, imperfection or error. Vitor Agostinho develops new processes to create objects of different shapes from a single mould. Vítor Agostinho creates cube-shaped moulds out of ceramics. He starts by hand-blowing the glass and then sets it in the ceramic mould, where it gets its final shape. Vítor Agostinho is a product designer with extensive experience in the ceramics industry. Following research in this area, he shifted his focus from pure design to that of customisation and self-production. His experience with ceramics provided him with the opportunity to develop his glassworking method of production alongside ceramic making and moulding. courtesy of: Dilmos Milano Glass vessel This colourless cut crystal vase is part of the Patches collection. The vase illustrates the techniques of fine glass cutting for which the Czech Republic is known. 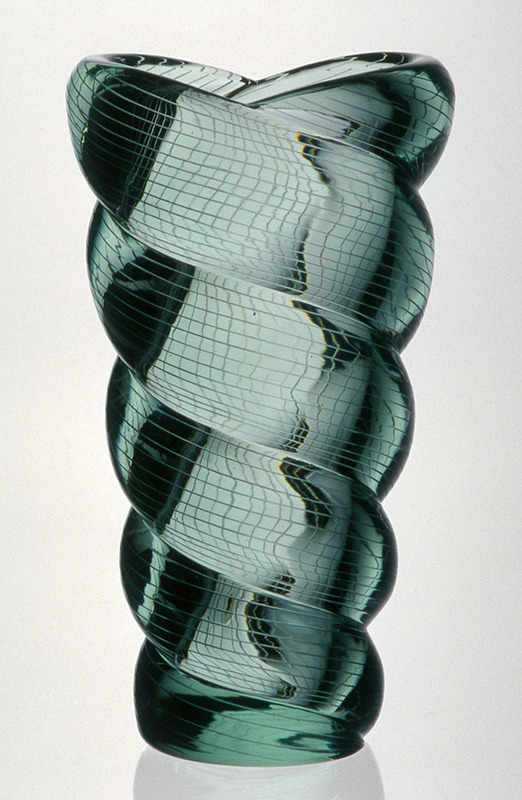 This vase combines fine cut-glass techniques characteristic of Bohemian glass with ancient methods for producing sheet glass, in which glass blown into a cylinder is cut away, opened up and flattened. Lasvit reheated a variety of objects already decorated with traditional cut glass patterns, then sliced them open and reattached them to each other to create one large object. The process was like sewing together animal hides or piecing together small fragments of cloth to create a large patchwork quilt. Lasvit is a creative hub of glassmaking talents, fresh ideas and daring designs founded in 2007 and based in the Czech Republic. This young and innovative company creates custom-made installations exhibited around the world. Lasvit’s dedication to producing limited glassware series or mostly made-to-order individual pieces in exclusive designs has captivated designers and made it an award-winning company. Lasvit was founded by Leon Jakimič, who manages the company with the utmost respect for the Czech Republic’s rich glassmaking tradition. Over the years, Lasvit has worked alongside numerous designers and artists, such as the Campana Brothers, Kengo Kuma, Yabu Pushelberg, Nendo and Ross Lovegrove. 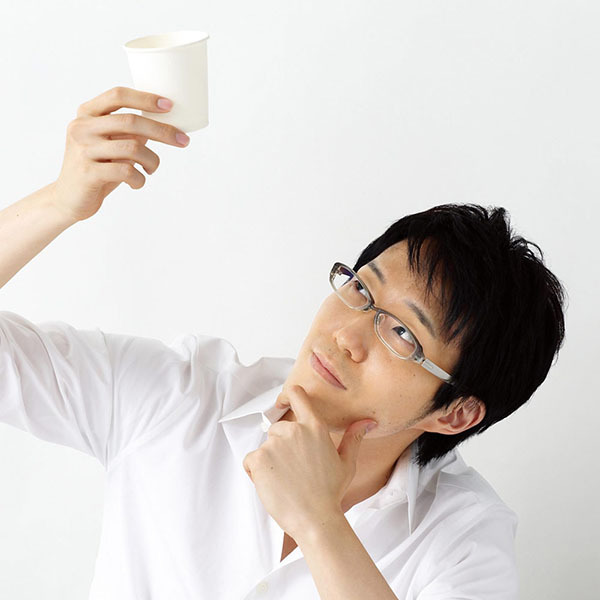 Japanese architect and designer Oki Sato created Nendo in 2002. Under his direction, Nendo, which means “clay” in Japanese, provides furniture design, interior architecture and graphic design that aim to be as flexible as clay is to work with. Born in Toronto, Canada in 1977, Oki Sato completed an MA in architecture from Waseda University, Tokyo in 2002 and immediately opened his own studio. In 2005, he established a Milan office and has since received international recognition for his innovative designs. In 2012, he started lecturing at Waseda University. Nendo designs aim to provide fresh perspectives by combining eco-design and traditional manufacturing processes. Lasvit is a creative hub of glassmaking talents, fresh ideas and daring designs founded in 2007 and based in the Czech Republic. This young and innovative company creates custom-made installations exhibited around the world. Lasvit’s dedication to producing limited glassware series or mostly made-to-order individual pieces in exclusive designs has captivated designers and made it an award-winning company. Lasvit was founded by Leon Jakimič, who manages the company with the utmost respect for the Czech Republic’s rich glassmaking tradition. Over the years, Lasvit has worked alongside numerous designers and artists, such as the Campana Brothers, Kengo Kuma, Yabu Pushelberg, Nendo and Ross Lovegrove. Japanese architect and designer Oki Sato created Nendo in 2002. Under his direction, Nendo, which means “clay” in Japanese, provides furniture design, interior architecture and graphic design that aim to be as flexible as clay is to work with. Born in Toronto, Canada in 1977, Oki Sato completed an MA in architecture from Waseda University, Tokyo in 2002 and immediately opened his own studio. In 2005, he established a Milan office and has since received international recognition for his innovative designs. In 2012, he started lecturing at Waseda University. Nendo designs aim to provide fresh perspectives by combining eco-design and traditional manufacturing processes. 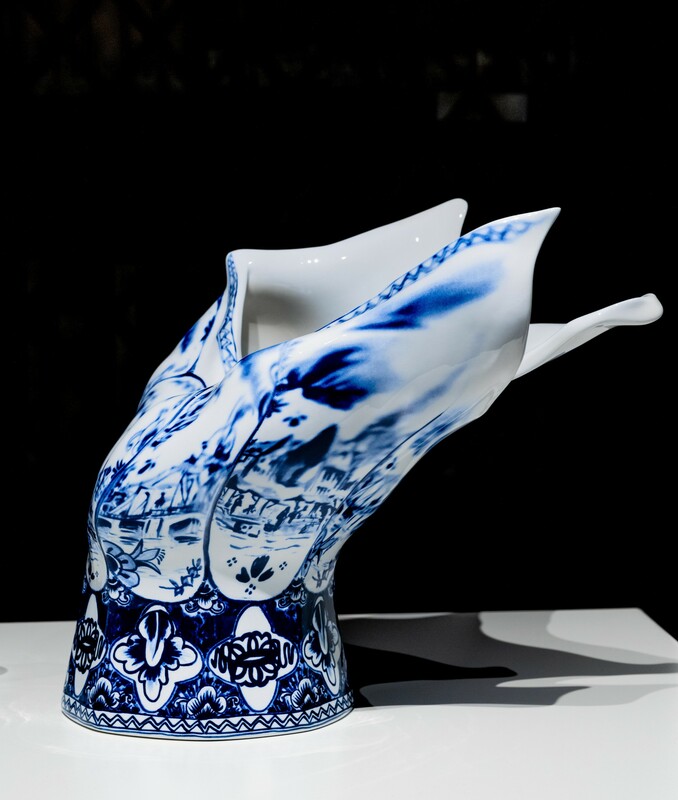 courtesy of: Röhsska Museet Ceramic vessel This classical tin-glazed Royal Delft vase looks as if it was pushed to its side by a powerful blast of wind. It is decorated with typical Dutch scenes painted in the characteristic blue and white of Delft ceramics. When Joost Thooft took over management of De Koninklijke Porceleyne Fles, aka Royal Delft, in 1876, he worked on improving the production process to ensure high standards of quality. The procedures he put in place endure to this day. The production process starts with the composition of the clay, made from ten raw materials, including kaoline, chalk feldspar and quartz. This takes a liquid form, which is then poured into plaster moulds. The moulds are left to dry, and after a certain time the object is taken out to be air dried. It is then sprayed with a layer of liquid clay and fired at 1160°C, resulting in biscuit. Lastly, the object is hand painted using a black paint containing cobalt oxide that turns blue when fired. It is then covered with a colourless glaze and fired at 1200°C, transforming it into a typical Delft Blue ceramic object. The Koninklijke Porceleyne Fles, more commonly known as Royal Delft, is the last of the 32 earthenware factories established in the Dutch town of Delft in the 17th century. The company was created in 1653 by David Anthonisz van der Pieth, who converted his house into a factory. The company changed hands soon afterwards. Then, owing to a sudden drop in availability in Europe of chinaware imported from China, Delft earthenware rapidly grew in popularity. The rise of another earthenware producer in Europe was likely the cause of the decline of Delft ceramics in the 19th century, and Royal Delft is the only factory that is still active today. Swedish design studio Front was founded in 2003 by three designers, Anna Lindgren, Sofia Lagerquist and Charlotte v.d. Lancken, and has been creating as well as pushing boundaries ever since. Its works are based on discussion, exploration and experimentation, and its members collaborate on all projects, from initial concept to final product. The design process also involves computers and robots and is inspired by animals, thus ensuring innovation and unexpected outcomes. In addition to objects for mass production, Front also creates many one-off pieces for collectors and galleries. The studio’s works feature in the Museum of Modern Art in New York, the Victoria & Albert Museum in London and the Centre Pompidou in Paris. 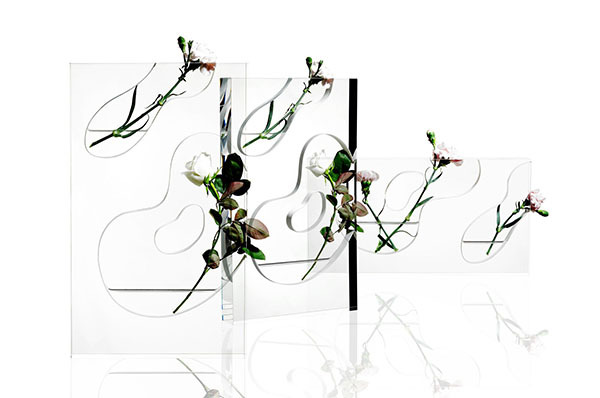 Swedish design studio Front was founded in 2003 by three designers, Anna Lindgren, Sofia Lagerquist and Charlotte v.d. Lancken, and has been creating as well as pushing boundaries ever since. Its works are based on discussion, exploration and experimentation, and its members collaborate on all projects, from initial concept to final product. The design process also involves computers and robots and is inspired by animals, thus ensuring innovation and unexpected outcomes. In addition to objects for mass production, Front also creates many one-off pieces for collectors and galleries. The studio’s works feature in the Museum of Modern Art in New York, the Victoria & Albert Museum in London and the Centre Pompidou in Paris. courtesy of: Röhsska Museet Ceramic vessel This ceramic vase is decorated with a gilded metal frame of seashells at the bottom of the vase and wavy seaweed patterns making their way up it. The reflective blue glaze of the vase contrasts with the gilded interior glaze. The cylindrical blue glazed vase was produced by Royal Copenhagen in 1908. The Royal Porcelain Factory, commonly known as Royal Copenhagen, is a Danish porcelain manufacturer founded in 1775 under the aegis of the Danish dowager queen, Juliane Marie. Three wavy blue lines make up the trademark that symbolises Denmark’s three seas. Royal Copenhagen originated in the context of a widespread European fascination with the white and blue porcelain imported from China during the Ming and Qing dynasties. It was founded by Danish chemist Frantz Heinrich Müller in a converted post office, and King Christian VII took over financial responsibility for the factory in 1779. Royal Copenhagen has grown and changed hands several times since, merging with other companies such as George Jensen and Bing & Grøndahl. 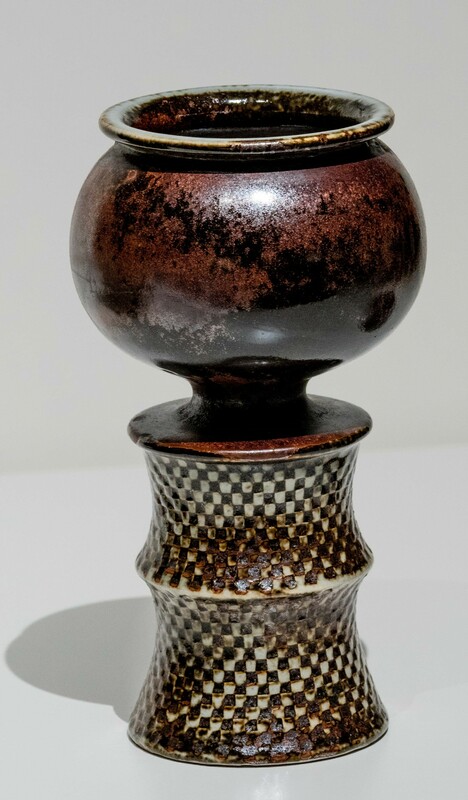 courtesy of: Alexander Nordling Ceramic vessel This brown glazed earthenware vase was designed by Stig Lindberg and manufactured by Gustavsberg. The vase is made in two segments. The cylindrical base of the vase is textured, revealing the vessel's base glaze. The body of the vase has a smooth surface. Swedish design is often described as minimalist, as is characterised by its simplicity and functionality. The emphasis on functionality and on clean and simple lines gained popularity after the Second World War. While this design style originated in Scandinavia, with each country following its own tangent, its influence spread rapidly to other countries. Gustavsberg was a Swedish porcelain, ceramics and faience factory founded in 1826 and broken up and sold off in the 1990s. At its peak, Gustavsberg porcelain was found in many Swedish households in the post-war era. Stig Lindberg was one of the factory's emblematic designers and is credited with being one of the principal reasons for the factory's survival after the 1940s economic crisis. Stig Lindberg (1916-1982) was a Swedish ceramics, glass, textile and industrial designer, as well as a painter and illustrator. He is best known for his china, enamel and textile designs and is considered one of Sweden’s most influential post-war designers. He studied painting at Stockholm's University College of Arts, Crafts and Design. He went on to work for Gustavsberg in 1937 and was named artistic director in 1949, a position he held until his retirement in 1980, designing individual objects as well as tableware for the company. courtesy of: Officine Saffi Ceramic vessel This earth-coloured pot designed by Kati Tuominen-Niittylä and created in 2015 reflects Tuominen-Niittylä's minimalistic exploration of surface structure. The pot has two small handles that face each other at opposing sides of the pot’s mouth. The stoneware has been left bare after firing. The works of Kati Tuominen-Niittylä are a fusion of memories, observation and emotions. She prefers a minimalistic structure with the addition of small gestures to create a quiet whole. While the firing of clay is an age-old tradition, Tuominen-Niittylä gives her works a contemporary feel by using modern materials whilst preserving their ceramic nature. Kati Tuominen-Niittylä (1947) is a Finnish designer best known for her designs for Arabia and Iittala. She graduated from the University of Art and Design in Helsinki in 1976. She worked in Arabia's Art Department from 1980 to 2003, when she left to set up on her own. However, she still maintains her studio in the Arabia factory. Archetypal shapes of buckets, sieves, bowls and baskets found on farms inspire Tuominen-Niittylä's forms. Her hand-thrown, hand-built coarse stoneware clay is fired at a high temperature and has an almost geological appearance. The surface of her works are patinated with colour oxides or carved with tools, revealing an interplay of colour and textures. Tuominen-Niittylä was awarded the Grand Prix and the Gold Medal at the International Ceramics Festival in Mino, Japan in 1998 and 2002, respectively, as well as the prestigious Kaj Franck Design Prize. courtesy of: Damiani Group Glass vessel This Libellula shaped vase in hand-blown glass was designed by Vittorio Zecchin and manufactured by Capellin Venini & Co. in 1922. The large organic shape of the handles meticulously attached to the lip of the vase are evocative of Art Nouveau designs. The 125 Venini colours are part of a time-honoured cultural heritage. Each colour is based on a special recipe, and the Venini range includes a great variety of shades, constantly expanding and evolving. Glass is composed primarily of pure silica sand that assumes various colours with the addition of metallic oxides. The melting temperature transforms the material into a bright orange mass. The master glassmaker shapes the object using the same tools as in past centuries. The temperature required to shape glass must never drop below 800°C during this process. After the first hot phase, the molten glass still has a temperature of 500-600°C and must be cooled slowly to avoid creating surface tensions that may cause breakage. This gradual cooling is carried out in special “annealing” ovens, also known as “muffles”. Once it has reached room temperature, the cold-processing phase, known as “grinding”, begins. Paolo Venini and Giacomo Cappellin founded Cappellin Venini & Co. in 1921. The company split a few years later, leading to the creation of Vetri Soffiati Muranesi Venini & Co., with Napoleone Martinuzzi as artistic director. Over the years, thanks to his passion for sculpture, Martinuzzi developed stunning innovations, brought to life by the skills of the master glassworkers in the Venini workshop. Venini has remained at the forefront of the industry and has set contemporary glasswork trends by continuously collaborating with cutting-edge designers and artists. Creations bearing the Venini signature have found their place amongst the iconic works exhibited in museums around the world, such as the Metropolitan Museum and Museum of Modern Art in New York, the Cartier Foundation in Paris and the Victoria & Albert Museum in London. Vittorio Zecchin (1878-1947) was an Italian painter and designer. The son of a Murano glassmaker, he studied at the Academy of Fine Arts in Venice. He frequented the Venice Biennales, where he met artists, architects and designers exhibiting their works. He was especially interested in the artistic trends of the time, in particular the avant-garde Vienna Secession movement, and developed an interest in applied arts, ranging from embroidery to tapestry and especially glass, which became a passion of his. 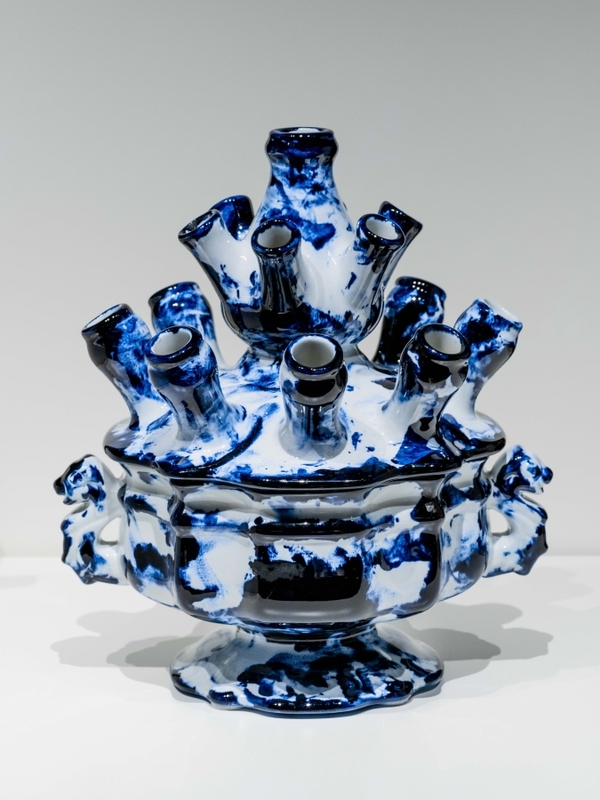 In 1914, Zecchin presented a series of pieces he had made at the Barovier glassworks. Between 1921 and 1925, he was artistic director for Capellin Venini & Co., designing modern pieces based on classical 16th-century Murano works. After leaving Capellin Venini, he began designing for a number of glass producers. In the 1930s, he also dedicated himself to teaching and working with schools. 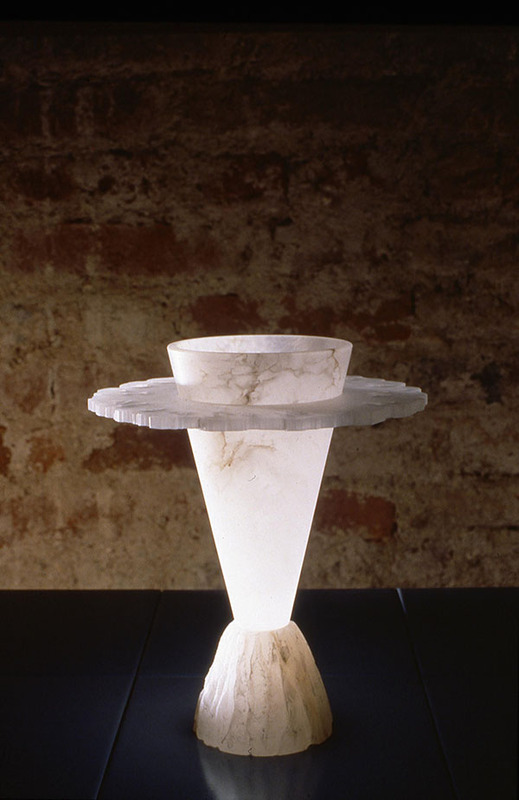 courtesy of: Studio e Archivio Ugo La Pietra Stone sculpture This alabaster vase with a cone-shaped body was designed by Ugo La Pietra and made by the Cooperativa Artieri Alabastro in 1992. The sculpture presents a play of textures, the base is rough and the chisel marks are still visible. In contrast, the body is smooth, and a bulb fitted in the interior brings out the light-coloured tones of the alabaster. Ugo La Pietra is a key figure and reference point for Italian craftsmanship, design and applied arts. The Archivio Ugo La Pietra catalogues his master works and documents. These are ordered by disciplines: Art, Architecture, Design, Applied Arts, Music, Didactics and Publishing. The archive is open to students, critics and researchers for consultation, and loans can be made upon request. Museums, cultural institutions, private galleries and collectors have assisted in the systematic archiving and cataloguing of the collection. The Ugo La Pietra Archive catalogues Ugo La Pietra’s master works and documents. These are ordered by disciplines: Art, Architecture, Design, Applied Arts, Music, Didactics and Publishing. The archive is open to students, critics and researchers for consultation, and loans can be made upon request. Museums, cultural institutions, private galleries and collectors have assisted in the systematic archiving and cataloguing of the collection. The Cooperativa Artieri Alabastro was founded in 1895 and is the oldest alabaster-producing structure in Volterra, Italy. The mission of the cooperative is to bring alabaster artisans with the necessary artistic, technical and commercial qualifications together with a view to ensuring quality products. Today, the cooperative has 27 partners. The artisans of the cooperative create works using traditional techniques. As well as its standard range of products, which is partially renewed each year, the cooperative makes custom-made pieces for its customers. The Ugo La Pietra Archive catalogues Ugo La Pietra’s master works and documents. These are ordered by disciplines: Art, Architecture, Design, Applied Arts, Music, Didactics and Publishing. The archive is open to students, critics and researchers for consultation, and loans can be made upon request. Museums, cultural institutions, private galleries and collectors have assisted in the systematic archiving and cataloguing of the collection. Architect by training, Ugo La Pietra is an artist, designer, architect, filmmaker, editor, musician, cartoonist and teacher. Originally born in Bussi sul Tirino, in Abruzzo, Italy, Ugo was raised in Milan. In an era characterised by machines and mass production, Ugo has dedicated his career to rediscovering age-old artisanal techniques. 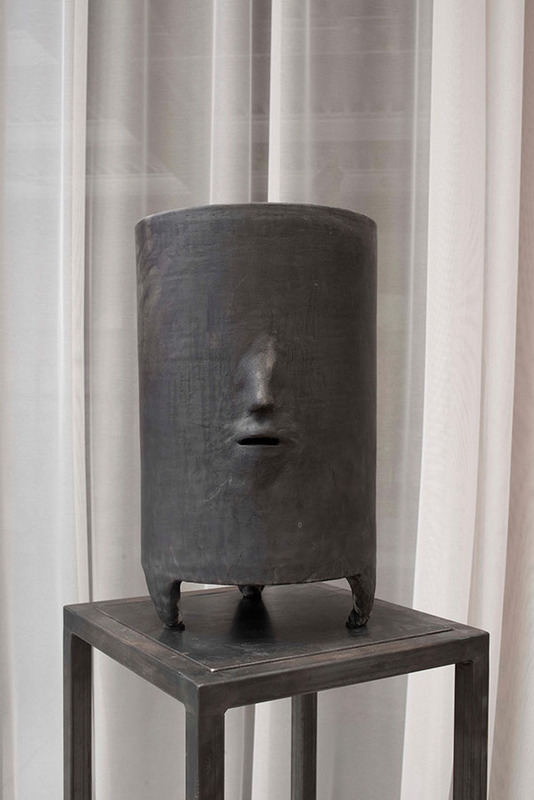 Ugo has exhibited his works both in Italy and internationally and curated numerous exhibitions including those at the Triennale di Milano, the Venice Biennale, the Musée d’art contemporain de Lyon, the FRAC Centre in Orléans and the International Museum of Ceramics in Faenza. The Cooperativa Artieri Alabastro was founded in 1895 and is the oldest alabaster-producing structure in Volterra, Italy. The mission of the cooperative is to bring alabaster artisans with the necessary artistic, technical and commercial qualifications together with a view to ensuring quality products. Today, the cooperative has 27 partners. The artisans of the cooperative create works using traditional techniques. As well as its standard range of products, which is partially renewed each year, the cooperative makes custom-made pieces for its customers. 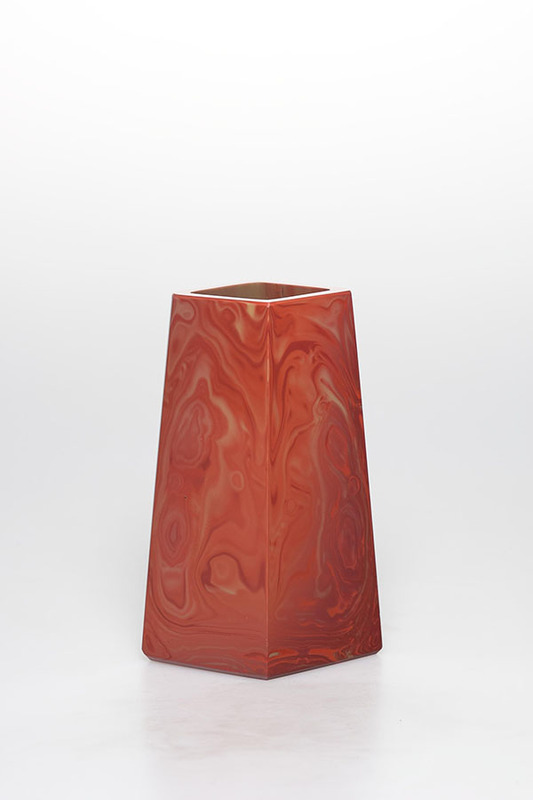 courtesy of: Caterina Tognon Glass vessel Bright red molten-like resin seems to slide down the surface of this vase creating the base on which the vase rests. Throughout his career, Gaetano Pesce has experimented with numerous materials, from classical wood, stone and glass to contemporary polymeric material. He has a particular interest in glasswork, even inventing a glassworking technique. Pesce has experimented with traditional methods of glass creation, such as pâte de verre (an ancient Egyptian method of glassmaking), developing and reinterpreting them in a contemporary manner. His works and designs combine a sense of form with the impulsiveness of the material. courtesy of: Alessio Sarri Ceramic vessel Geology was designed by Ettore Sottsass Jr and manufactured by Alessio Sarri Ceramiche in 2000. The sculptured vase is composed of 15 individual layers of boxes of different sizes, in nine different matt glazes, and with an inner container for flowers in white porcelain. The overall form (gestalt) is reminiscent of that of a classical vase. 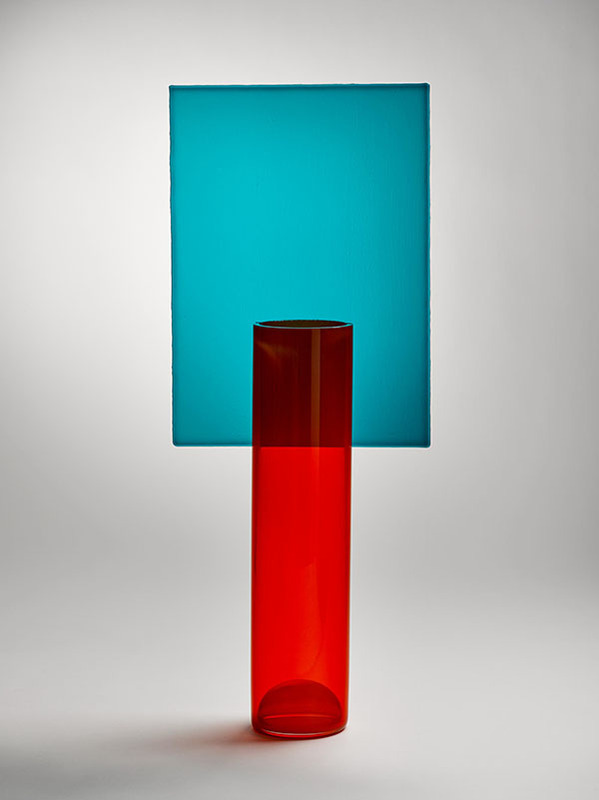 The vase is characteristic of Sottsass's post-modern design and concept of utilitarian sculptural objects. The collaboration between Alessio Sarri and Ettore Sottsass Jr dates back to the mid-1980s. When the young ceramicist Alessio Sarri met Sottsass, the latter decided to put him to a test and asked him to transpose his projects of the past decade into ceramics. This resulted in numerous experimentations to create works that would eventually push technical boundaries and that, while being architectural in their design, also convey a sculptural quality. The first exhibition of the Memphis Group, held in Milan in 1982, resulted in the creation of Alessio Sarri Ceramiche. 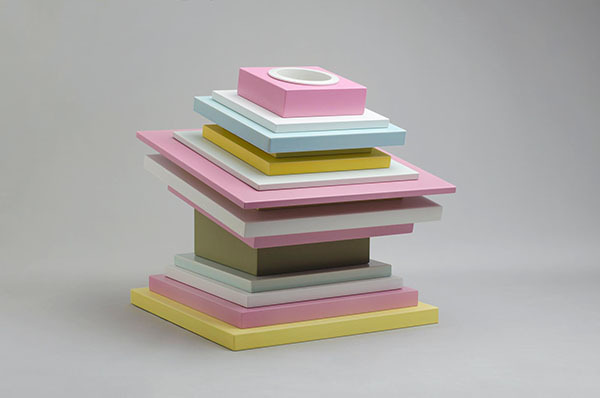 It was ceramicist Alessio Sarri who brought to life the creations of members of the group, which included Ettore Sottsass Jr and Nathalie du Pasquier. Each piece in the collections is enhanced in its aesthetic value by its manual creation and original production techniques. Sarri's ceramics are eye-catching, their forms emerging from the repetitive design of everyday objects, while keeping their original function. Alessio Sarri was born in 1957 in Sesto Fiorentino. He attended the Art School of Porta Romana in Florence and subsequently developed an interest in dance and theatre. In 1981, he met Matteo Thun and created the first prototype of a container. The complete collection of Rara Avis containers was presented during the Memphis Group's exhibition in 1982. From thereon, Sarri followed a path of research in the fields of design and ceramics, experimenting with new methods and techniques. Ettore Sottsass Jr (1917-2007) was an Italian architect and designer known for his furniture, jewellery, glass, lighting and office designs. Born in Innsbruck, Austria, and raised in Turin, he studied at the Politecnico di Milano, graduating in 1939 with a degree in architecture. After the war, he worked with his father, also an architect, rebuilding houses, often in a Modernist style. In 1947, he moved to Milan, where he opened an architecture and industrial design studio. The studio was awarded numerous contracts that required him to work regularly in the United States from the late 1950s, and to design electronic devices and the first Italian mainframe computer for Olivetti. These experiences would lead to the creation by Sottsass of the Memphis Group in the early 1980s. The group is famous for its Postmodern designs produced during the 1980s. 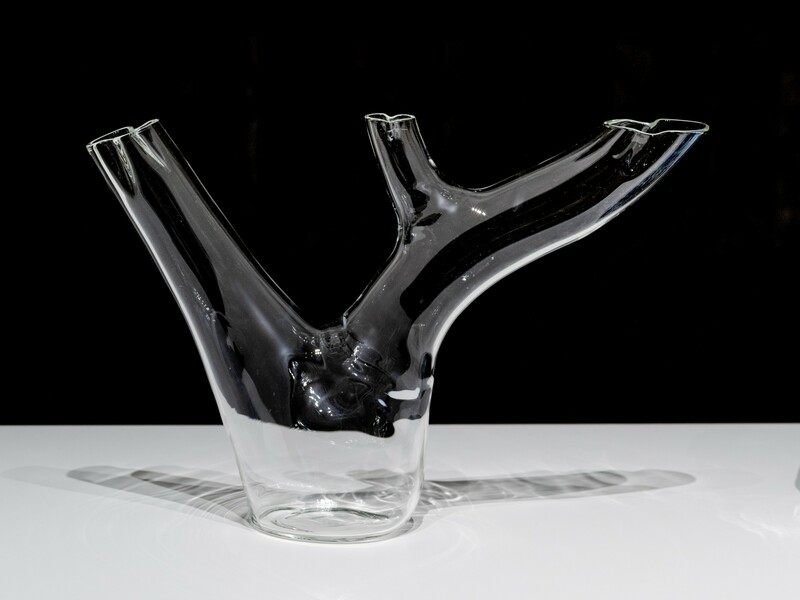 courtesy of: Galleria Giovanni Scacchi Synthetic vessel This transparent vase designed by Andrea Branzi and created by Metea for the Giovanni Scacchi Gallery was made from plexiglas in 2005. 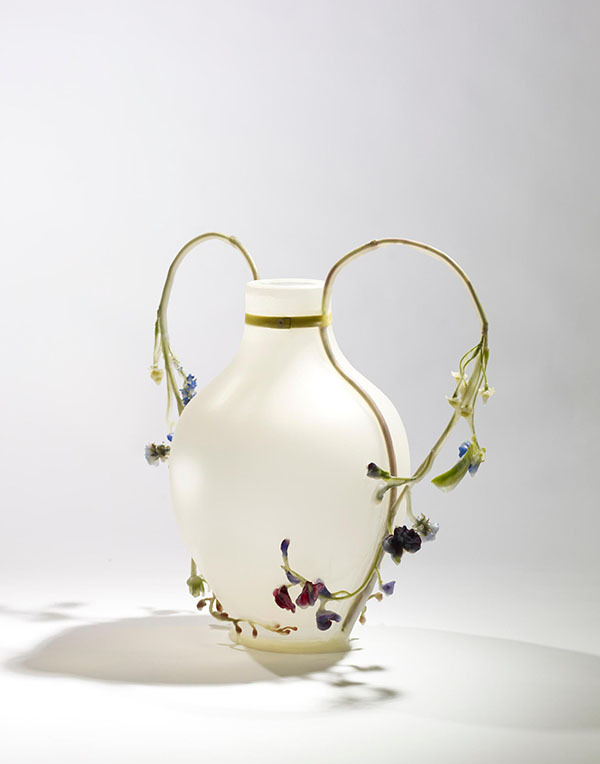 The vase has two openings that evolve into two organic forms creating receptacles for flowers. Enzimi is a collection of plexiglas vases, made by Metea and presented at Giovanni Scacchi Gallery during the Salone del Mobile in Milan in 2005. These are very special vases, because the interior spaces are more important than the external ones, and have different shapes. Even the flowers can be inside or outside the vase. So, this is a collection that responds to Andrea Branzi’s idea of the enzymatic spaces as internal places of the bodies, different and autonomous from the external forms we see. However, they complete fundamental functions, precisely through the action of enzymes, which produce a silent energy of transformation and development. Even today’s cities are organisms where the internal environments are autonomous and fundamental for general functioning. The qualities of a place therefore depend above all on its internal qualities. And this also applies to people. The Giovanni Scacchi Gallery was founded in 2003 in Milan. The gallery collaborates with international artists, designers and architects such as Andrea Branzi, Toyo Ito and Alessandro Mendini. It deals with contemporary design and places particular emphasis on developing work in the field of plexiglas. Architect and designer Andrea Branzi (1938) has worked and lived in Milan since 1973, when he moved from his native Florence. In 1966, with fellow architects and designers, he founded Archizoom Associati to promote avant-garde architecture. In 1976, he joined the Alchemia design group founded by Alessandro Guerriero, which was known for its experimental industrial design. Branzi was also one of the founders, in 1983, of the Domus Academy, the first international postgraduate school of design. His works feature in many museums and exhibition spaces, such as the permanent collection of the Cartier Foundation in Paris. 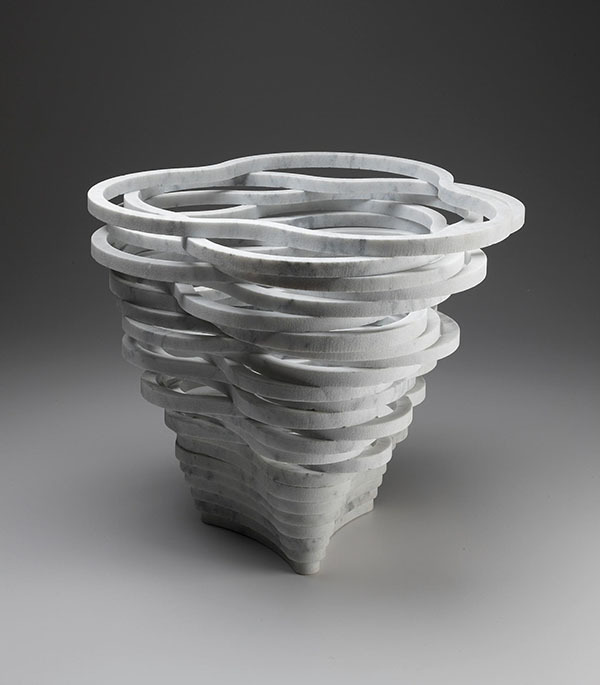 He was named Honorary Royal Designer by the United Kingdom in 2008.
courtesy of: Paolo Ulian Stone sculpture The 24 concentric rings that make up this vase come from three slabs of Carrara marble cut by waterjet. 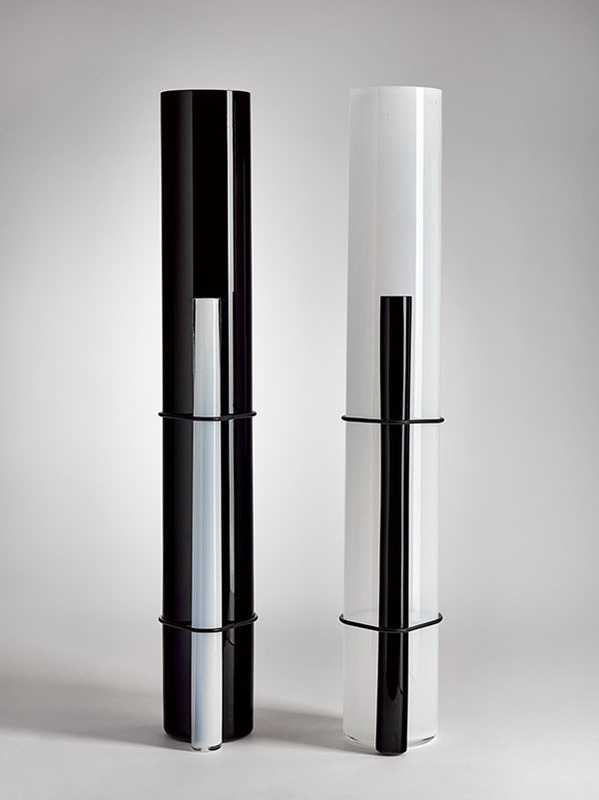 The vase was designed by Paolo Ulian and made by UpGroup in 2008. Paolo Ulian is an Italian designer born in Massa-Carrara in 1961. He studied painting at the Academy of Fine Arts in Carrara, attending classes by Getulio Alviani and Luciano Fabro. Uliani then enrolled at the Institute of Industrial Arts in Florence, graduating in 1990. In 1992, he opened a studio in Tuscany with his brother Giuseppe. He has exhibited his work both in Italy and abroad and won the first edition of the international Design Report Award presented by the German Design Council. He has gone on to glean further awards and has worked on designs for a number of Italian companies, such as Fontana Arte, Luminara and Zani e Zani. courtesy of: Galleria Luisa Delle Piane Glass vessel Hand-blown borosilicate glass vases in different shapes and sizes are held together by strips of flower-printed fabrics. The smaller vases are knotted to one bigger central vase, as if it represents the original shape from which the secondary “roots” branch off. Radici was presented at Galleria Luisa Delle Piane in Milan in 2015 during Design Week. Andrea Anastasio loved to paint and make things from an early age but never imagined that it would become his career. In fact, as a philosophy student, he had planned to stay in academia his whole life. One day, a friend invited Anastasio to Ettore Sottsass’s 70th birthday party, where he found himself surrounded by the Italian design world. At the party, Sottsass complimented him on a broach he was wearing. Anastasio replied that he had made it himself. Sottsass asked if he was a designer and when told he was not but rather a student of eastern philosophy, Sottsass was intrigued. A month or so later, Sottsass invited Anastasio to his studio to discuss oriental philosophy and later involved him in a project to catalogue Islamic architecture in India. This marked Anastasio's first steps into the world of Italian design. Andrea Anastasio studied philosophy before embarking on a cultural journey that led him to cooperate on projects entailing the cataloguing of Islamic architecture in India, research on innovation in traditional craftsmanship techniques, and partnerships with architectural practices, publishers and museums. Fascinated by the study of the poetics of conceptual art and its potential convergences with industrial design, he designs furniture and objects for Italian companies that play a leading role on the international scene. His research focuses on the manipulation of objects, consumer goods and domestic materials to generate cross-contamination of languages and meanings. courtesy of: Nilufar Ceramic vessel The works of Cathrine Raben Davidsen explore a dialogue between art and design, such as this vase that combines the utilitarian with a work of art. The vase is full of life. It gives the impression that it is holding a face that is trying to break free. The works of Danish artist Cathrine Raben Davidsen combine historical, fictional or mythological material with personal memories. Her work is characterised by a desire to explore different artistic techniques and challenge traditional hierarchies in the arts, such as artisan, designer and artist. In recent years, ceramics have played an increasingly important role. She draws inspiration from pre-Columbian, Japanese and late Bronze Age Scandinavian craft traditions and techniques, as well as raku firing. Cathrine trained at the Royal Danish Academy of Fine Arts in Copenhagen and at academies in Holland and Italy. Her works have been exhibited in galleries and museums in Denmark and around the world. courtesy of: Museum Kunstpalast, Düsseldorf, Germany Glass vessel This rectangular opaque vase decorated in red tempered glass with yellow-greenish marbling was designed by Peter Behrens and manufactured by Josef Rindskopf's Sohne in Bohemia circa 1900. The vase is mould-blown and its entire surface ground flat and polished. Peter Behrens is considered by many to be the father of German modern industrial design. He was one of the founding members of the Munich Secession, a movement created in 1892 by visual artists wishing to break away from the aging designs of the Munich art schools and that became known for its Art Nouveau designs. Peter Behrens went on to co-found in 1907 the Deutscher Werkbund, an association of artists, architects, designers and industrialists that would pave the way for the Bauhaus movement. The creation of the association was strongly influenced by the work and philosophy of the Arts and Craft Movement in the United Kingdom personified by William Morris and John Ruskin. Josef Rindskopf (1829-1890) was born in Teplitz in the present-day Czech Republic. Teplitz had some well-established glass companies, one of which belonged to his father. Josef Rindskopf himself co-owned a glass company with his brothers. A year after his death in 1890, his four sons created a new glass company called Josef Rindskopf's Sohne. To begin with, the Josef Rindskopf's Sohne factories mainly produced blank glass, which would be sent to other factories to be decorated. In the 1890s, the company bought specialised equipment for etching, painting and sandblasting, enabling it to implement a complete cycle of production. The company produced iridescent glass in the Art Nouveau style for export. Financial constraints in the 1930s saw the company sold and taken over by another glass manufacturer. The Diluviumglas is a variant of the stone glasses of the Biedermeier period made from opaque red tempered glass with yellow-greenish marbling. Peter Behrens( (1868-1940) was a German architect and designer, and an important figure in the Modernist movement, working on projects with architects such as Le Corbusier and Walter Gropius. He started out by studying painting, to which he dedicated the early years of his career. In 1899, Behrens was the second person to build a house in the Darmstadt Artists' Colony. This was a defining moment for Behrens as an architect. The move away from Munich signalled a progressive distancing from the Jugendstil (Art Nouveau) movement towards a more sober and austere style of design. Behrens worked with numerous academic institutions and companies both within his native Germany and abroad. Large vase Glass vessel This free-blown grey glass vase with a fused ring below its mouth was designed by Andries Dirk Copier and produced by Glasfabriek Leerdam in 1932. Andries Dirk Copier not only created pieces himself at the Royal Leerdam Glassworks but was also head of the design department. As such, he was in charge of both production and design at the factory. This was quite uncommon and offered him a unique perspective, which helped to revolutionise design and production techniques. The Unica series was the result of a collaboration between designer and glassworkers. These one-of-a-kind objects were handmade and, throughout the series, display an impulsive and free design that contrasted with the sharp geometric designs typical of Art Deco. Royal Leerdam Crystal was founded in 1765 in Leerdam, Netherlands as a bottle manufacturer, expanding over time to produce high-quality glass tableware. At one time, it was the glassblowing department of [bGlasfabriek Leerdam. Numerous designers have contributed to the company's output throughout its rich history, including Andries Dirk Copier, Floris Meydam and Willem Heesen. In 2003, Royal Leerdam merged with Libbey, the second largest glassware producer worldwide. Andries Dirk Copier (1901-1991) was born in Leerdam, Netherlands, the son of a glass blower at the local glass factory. Copier joined the factory at the age of 13 as an apprentice in the etching department. From 1917 to 1919, he studied typography at the technical college in Utrecht and subsequently attended the Rotterdam Arts Academy. In 1923, Copier was appointed designer of the Leerdam glass factory's advertising and publishing activities and also started designing glassware, including his “Unica” (one-off) pieces. He also created designs for the textile and ceramics industries. In 1940, he founded the Glass School in Leerdam, which he also directed. Although the original aim of the school was to train employees of the glassworks, it expanded to include students of decorative arts and, later, artists as well. Copier was also director of the School of Applied Arts in Amsterdam. courtesy of: Victoria and Albert Museum Glass vessel This clear glass baluster vase was designed in 1988 by Marie-Claude Lalique and manufactured in 1994 by Lalique glassworks, Paris. 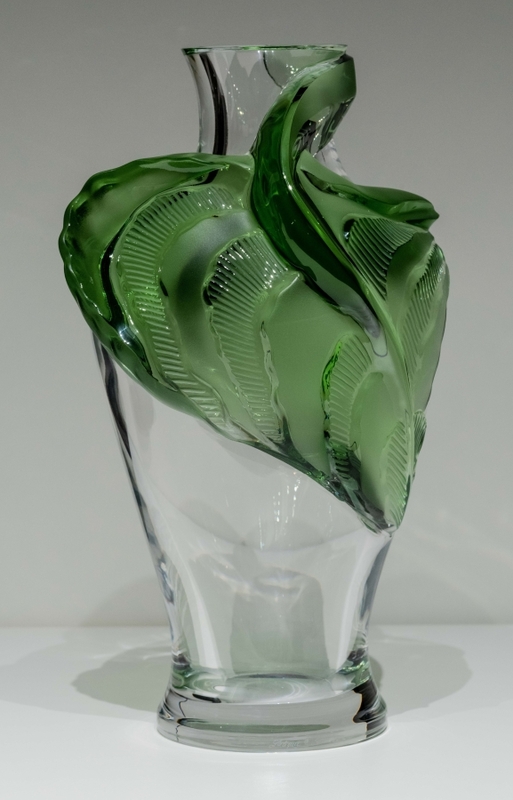 A green leaf made of glass is placed on the upper part of the vase. Much in line with its historical designs, Lalique’s current designs are inspired by three principal themes: women, flora and fauna. Today's design studios stay true to the original methods of design using pencil and modelling but have also adapted to modern innovations such as the digitalisation of designs and 3-D printing. The entirety of Lalique’s present-day output continues to be produced in the historic factory built by René Lalique in 1921 in the village of Wingen-sur-Moder in Alsace, France. The production process is carried out by the hands of expert artisans, four of whom have been awarded the tile of Best Artisan in France. It starts with the creation of moulds in which the glass is shaped. Roughly two thirds of the time spent working on Lalique glass is dedicated to cold working to alter the surface texture of the glass. Lalique is a French glasswork company founded in 1888 by jewellery designer and glassmaker René Lalique (1860-1945). During its early years, Lalique produced fine jewellery, combining gold and gemstones with other precious materials such as mother of pearl and ivory. As of 1890, Lalique started to experiment with glass, but it was not until 1907 that he began to market glassware in his shops. The company quickly became known for its glass art, notably on vases, perfume bottles and ornaments. René Lalique was considered one of the driving forces behind French Art Deco design. On his death, he was succeeded by his son Marc and subsequently his granddaughter, Marie-Claude Lalique. Having had no children, Marie-Claude Lalique sold the company to the Pochet Group in 1994, which later sold it to the luxury goods group Art & Fragrance, recently renamed the Lalique Group. In contrast to her grandfather, René Lalique, who sketched his designs, Marie-Claude Lalique (1935-2003) created models of her subjects in Plastiline. Her works took their inspiration from nature and the animal kingdom. She created a jewellery line in the 1960s, and on taking over management of Lalique in 1977, she strove to place the company and its designs at the vanguard of contemporary trends. courtesy of: Museum Kunstpalast Glass vessel This green shade vase was made by Hessen-Glaswerke and finished by glass cutter Fritz Berg in 1970. Hessen-glaswerke GmbH was founded in Stierstadt, near Frankfurt, Germany just after the Second World War, as a result of a large influx of internally displaced people from Sudetenland. These brought with them the extensive glassmaking expertise of their native region, and a group of families joined forces to open a glassworks in a factory that had been heavily bombed in 1942. Once the site had been released from Allied occupation in November 1946 and cleaned up, the glass factory was able to begin operations. The first products suffered from the poor quality of the available materials, but the factory soon began producing lead crystal and crystal glass, reaching maximum capacity by the mid-1960s. The 1970s saw the company's rapid decline and the premises were sold in 1990. Fritz Berg is a German glassworker specialising in the cutting and wheel grinding of glass. Glass has been an inseparable part of his life since his apprenticeship in 1948.
courtesy of: Centre International de Recherche sur le Verre et les Arts Plastiques - CIRVA Glass vessel A hand-blown cylindrical vase made of red coloured glass is juxtaposed with a square sheet of blue glass fitted vertically above the vase. The vase evokes the style of the Memphis Group, with whose members Pierre Charpin worked in his early career. 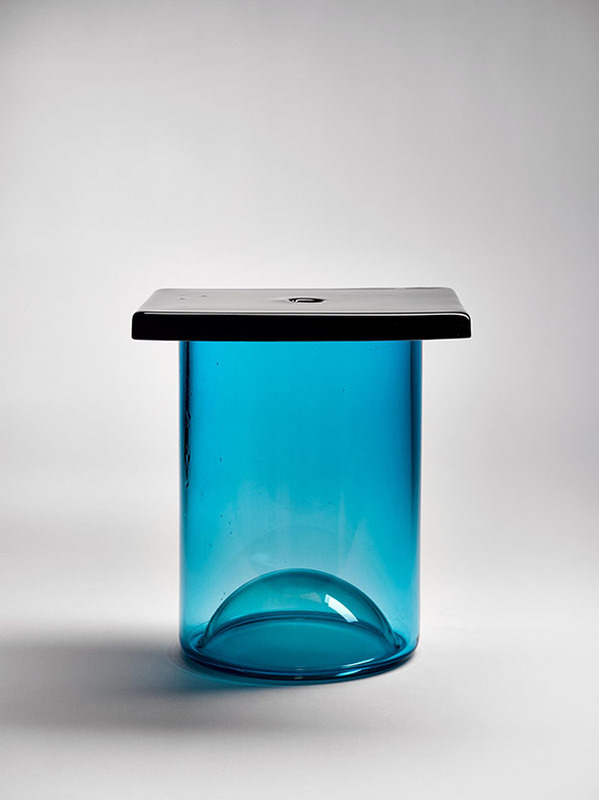 courtesy of: Centre International de Recherche sur le Verre et les Arts Plastiques - CIRVA Glass vessel A hand-blown cylindrical vase made of blue glass contrasts with a square sheet of blue-purple glass placed over the vase opening. The vase evokes the style of the Memphis Group, with whose members Pierre Charpin worked in his early career.